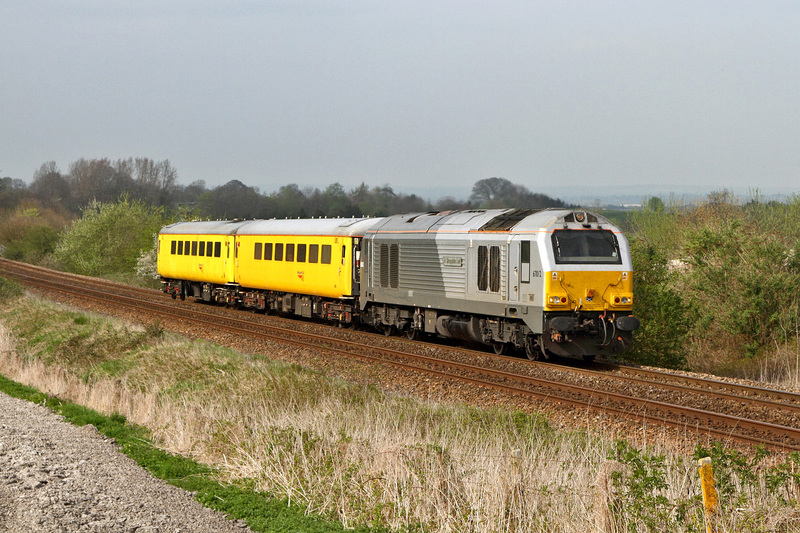 Originally introduced as a replacement for 47/7's on Mail workings but that all went to the wall so now mainly used on Charters,VSOE,Sleepers and 'Hire-Out' for LCHS work plus a couple with Colas for Test-Train operations. 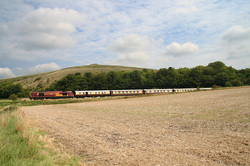 rake of vintage Pullmans. 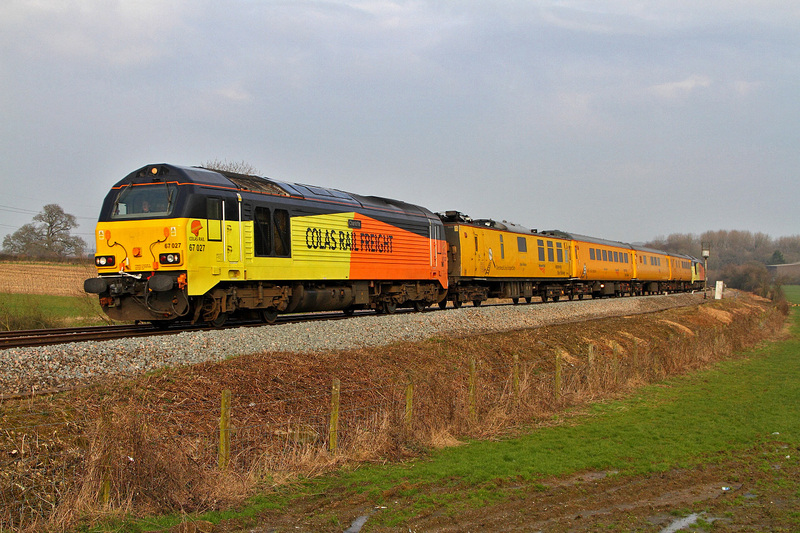 Seen passing Heywood Village at Church Road with the sun now rapidly approaching the horizon.A very pleasing shot! 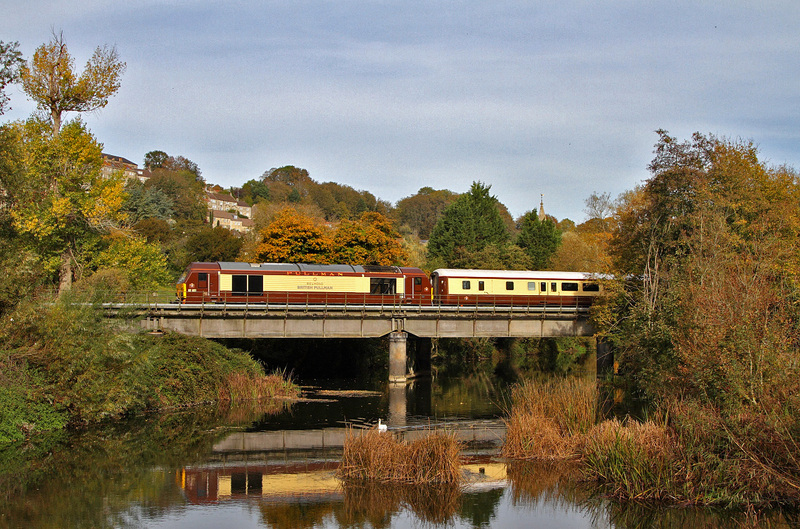 The dedicated Pullman liveried 67021 passes over the River Avon at Bradford-on-Avon with '1V80' the 09:45 from London-Victoria 'Belmond British Pullman' to Bath Spa.Similarly liveried 67024 was on the rear somewhere! 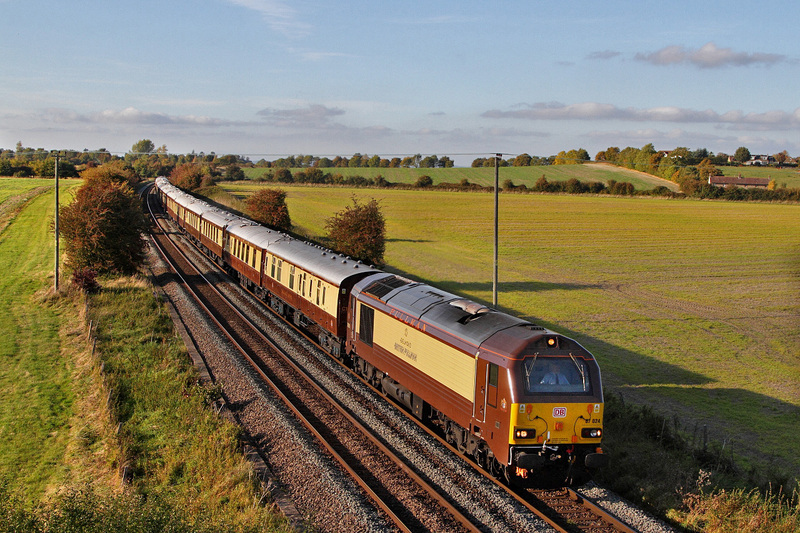 The shadows are beginning to lengthen appreciably now even at 17:00 in early October.Here is the Belmond British Pullman travelling back from Bath-Spa (15:55 off) to London Victoria as '1O92'.The dedicated pair of DB 'Skips' 67024 and 67021 are seen working top-n-tail as the train is approaching Warminster at Arn Hill. 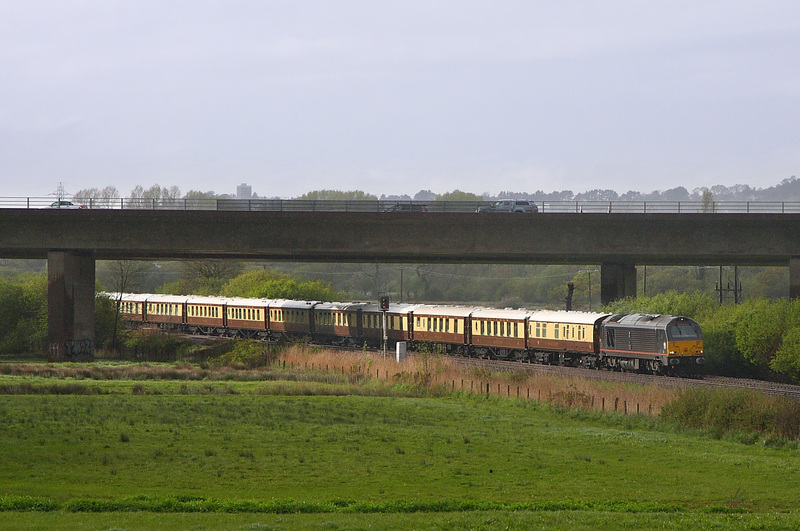 67024 tagged on the rear of a fast disappearing '1V80' The Belmond British Pullman led by 67021 was too good an opportunity to miss even though it was a GAW type shot simply because the lighting was just about perfect.Viewed with Hawkeridge Junction in the background. 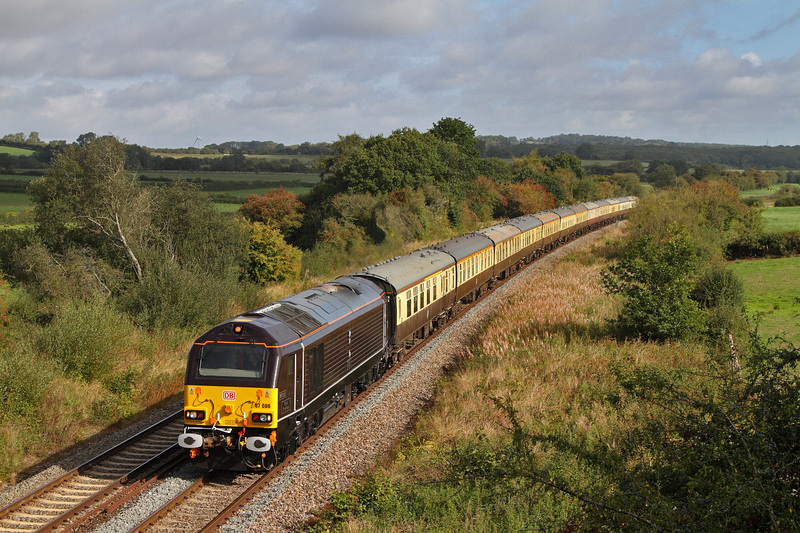 67021 now in full 'Belmond British Pullman' livery heads '1V80' the 09:45 from London-Victoria to Bath Spa luxury excursion.Similarly liveried 67024 being on the back end.This loco will work the return train later this afternoon.Seen at a rather autumnal Hawkeridge nr Westbury. 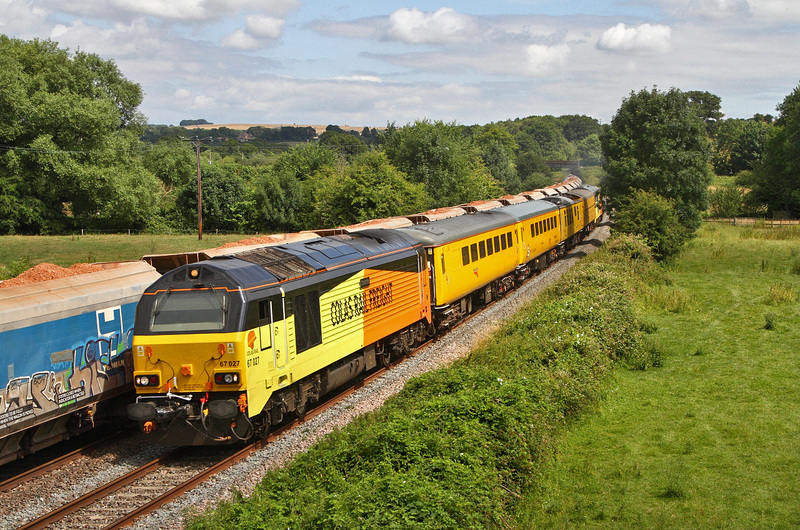 Fresh out of the Paint Shop in its new incarnation of 'Royal' livery 67006 'Royal Sovereign' speeds down through Upton Noble at Strap Lane wirh 'The Torbay Flyer' running as '1Z14' the 06:42 from Letchworth going down to Paignton with a nice length train of 12 carriages. Yippee! Back to normal UK summer weather! 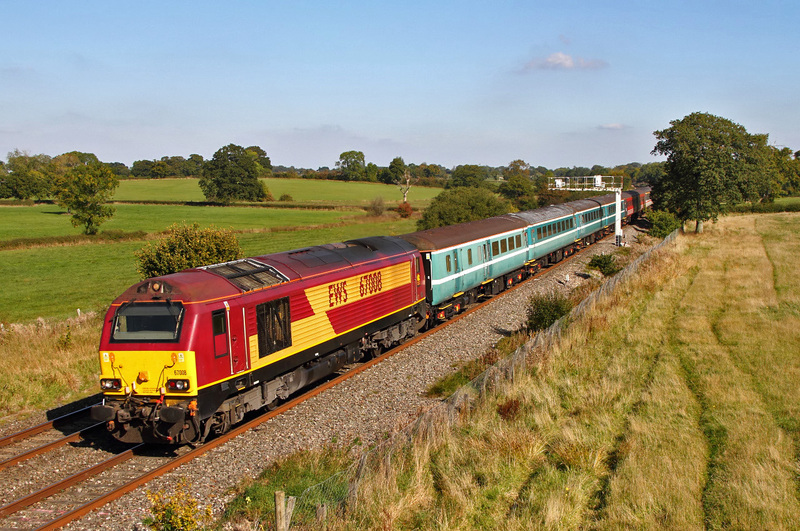 DB's 'Arriva-Trains Wales' liveried 67002 is seen at Arn Hill with '5Z64' the returning ECS from Bristol-TM to Eastleigh Arlington (ZG).The railtour excursion yesterday that used this stock went to Appleby on the Settle&Carlisle and return. 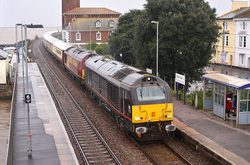 Todays '1Z22' from Tyseley-LMD to Bristol-High Level via Weymouth passes Blatchbridge-Junction in quite dire lighting. 67027 leads with 67023 on the rear.For some reason the test schedule was curtailed at Castle-Cary and it repassed this spot 173 minutes early.Obviously the set must have suffered some kind of equipment failure as the rest of the days testing was scrubbed finally getting to Bristol-HL a whopping 270 minutes early! 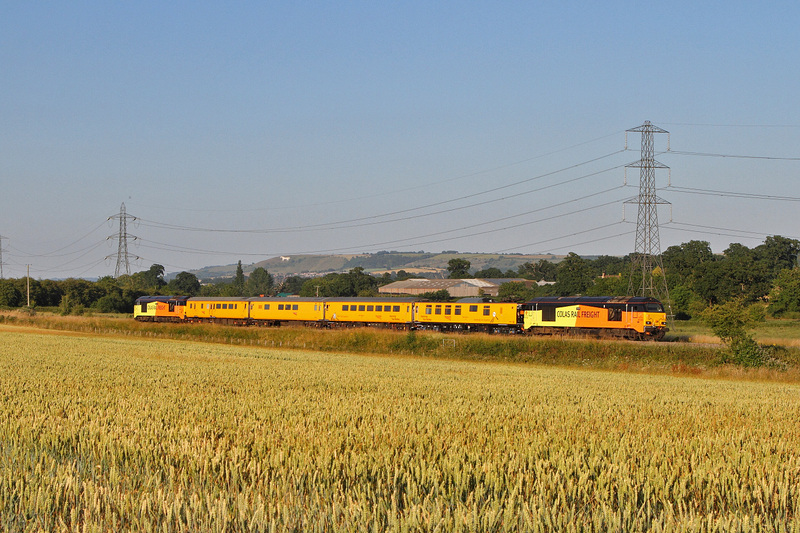 Today's NMT was substituted by this set-up of Colas's 67023/67027 plus the necessary test coaches working '1Q19' the 18:57 from Taunton going up to Paddington.Viewed across the ripening cornfields nr Frome with the freshly cleaned Westbury-White Horse in the background 7 miles away.Apparantly Colas are to pull out of all freight activity in the UK apart from Network-Rail infrastructure contracts.Whether that means the end of Colas-67's on Test-Trains is an unknown quantity???? 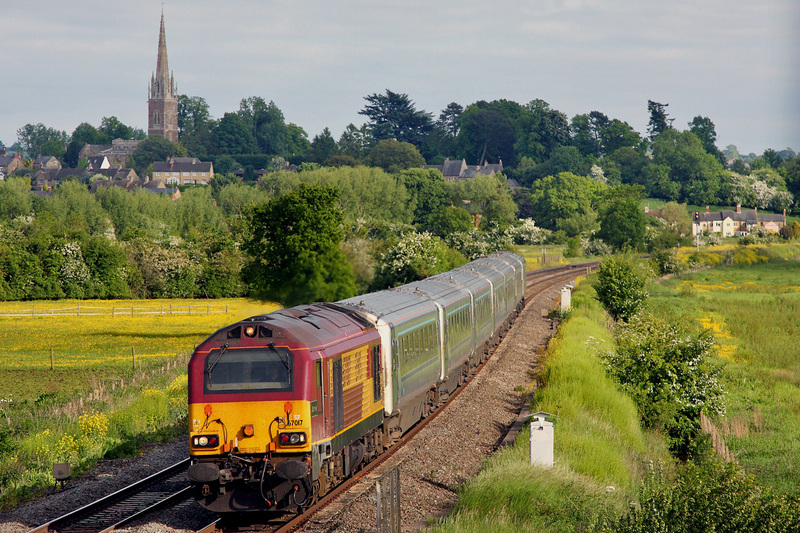 With 67027 leading and 67023 on the trailing end '1Q23' the Reading Triangle Sdg's to Salisbury via Exeter and Westbury passes Heytesbury in the Wylye Valley now on the final leg to Salisbury.Again the thing was 30 minutes early here but this time I was ready for it and the odd floater that was lurking around was evaded! 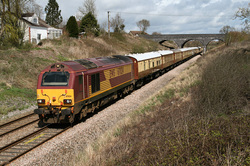 A combination of circumstances including this train running about 40 minutes early resulted in having to picture this working here instead of the original chosen location of Bapton further down the Wylye Valley.As it happens the people there waiting for this working got done-over by a floater so this 'plan-B' wasn't so bad after all! 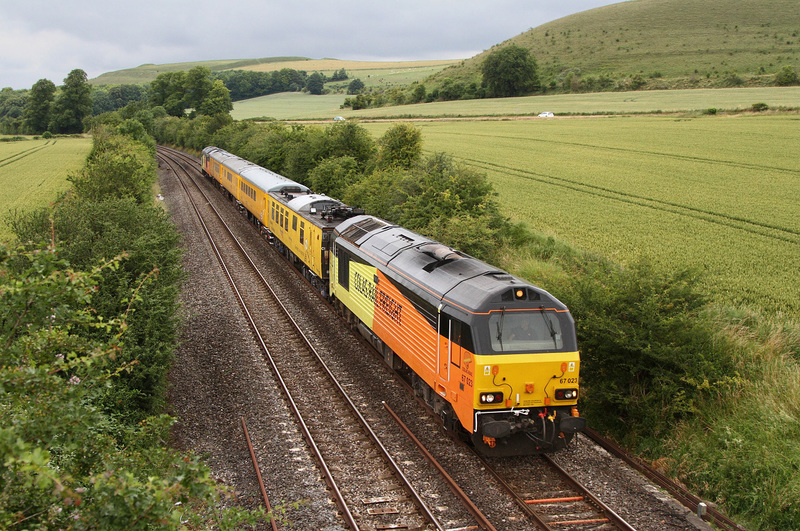 Here are the 'Colas-2' 67023/67027 working '1Q23' the Reading Triangle (05:41 off) to Salisbury via Exeter & Westbury Viewed under Scratchbury Hill at Norton Bavant nr Warminster. After three days solid of over-eating and quaffing champange the lucky passengers enjoy their ride home from Truro (12:15 away) returning them to London-Victoria as '1Z83'. 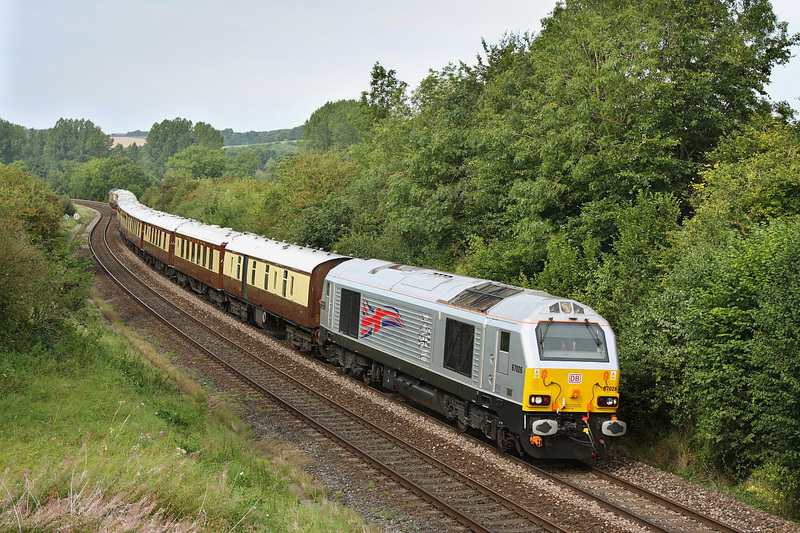 Belmond-British Pullman liveried 67021 was leading this return journey with its matching partner livery-wise 67024 tagged on the rear of this 12 coach set,10 of which are classic wooden pullman coaches.Viewed passing Berkley Marsh nr Frome running slightly late albeit in rather dull conditions having been held for some reason at Taunton ! 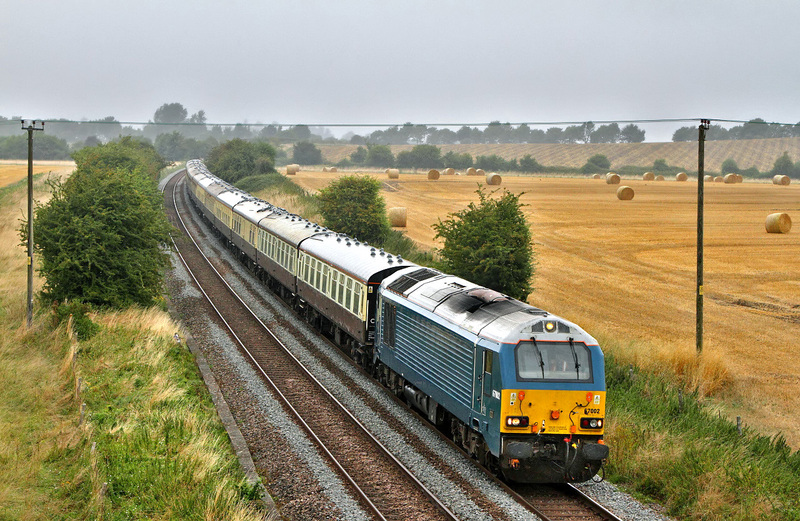 Considering the fact it was 'hissing' down with rain and I was holding an unbrella in one hand whilst shooting this shot with the other it didn't turn out too bad after all! 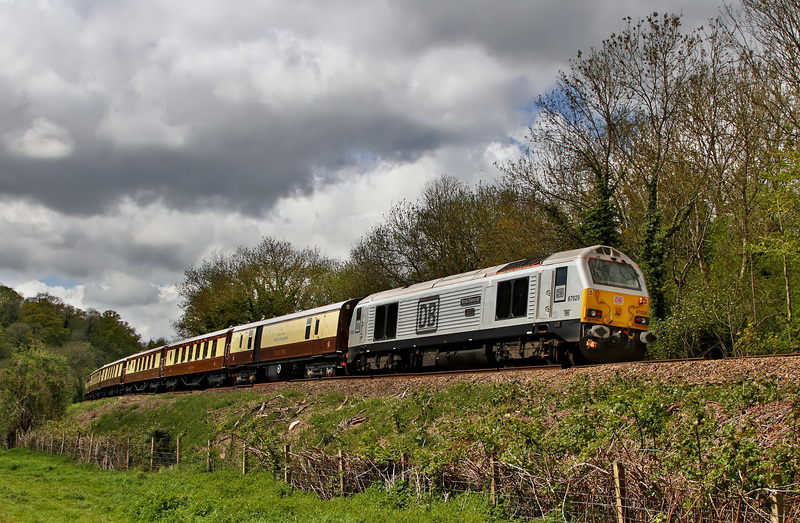 This is the Belmond Pullman run '1Z78' from London-Vicoria (09:48 off) going today as far as Truro.Pullman liveried 67024 was leading whilst similarly attired 67021 was on the rear.Viewed at a rather soaking wet and desolate Fairwood nr Westbury as it gets away after a short halt in Westbury Station. 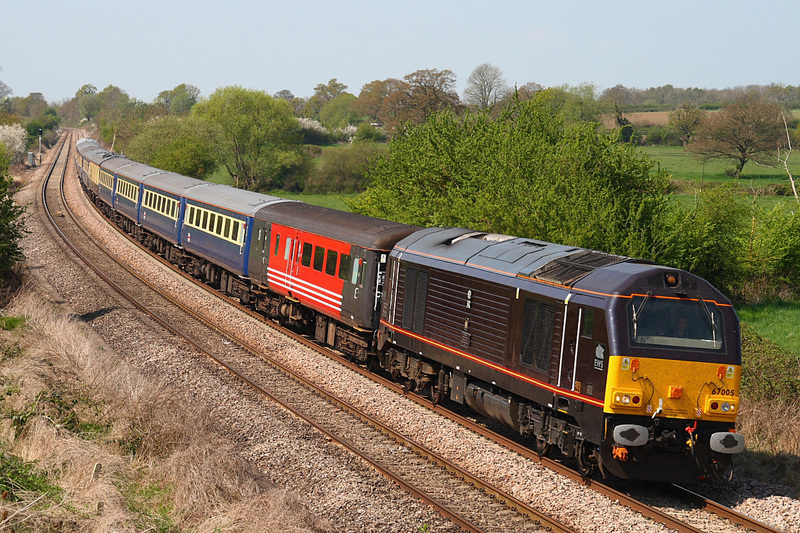 One of DB's latest repaints 67028 c/w a somewhat out of place Logo 'Leading the next generation of rail freight' today headed the returning Belmond Pullman '1O92' from Bath Spa (15:55 off) back to London-Victoria.Pullman liveried 67024 being out of sight on the rear.Unfortunately I missed a brief period of bright sunlight by about 20 seconds (An all too familiar story these days for me!) 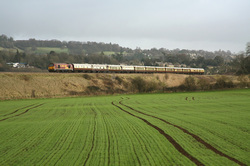 as it passed Arn Hill on the approach to Warminster. 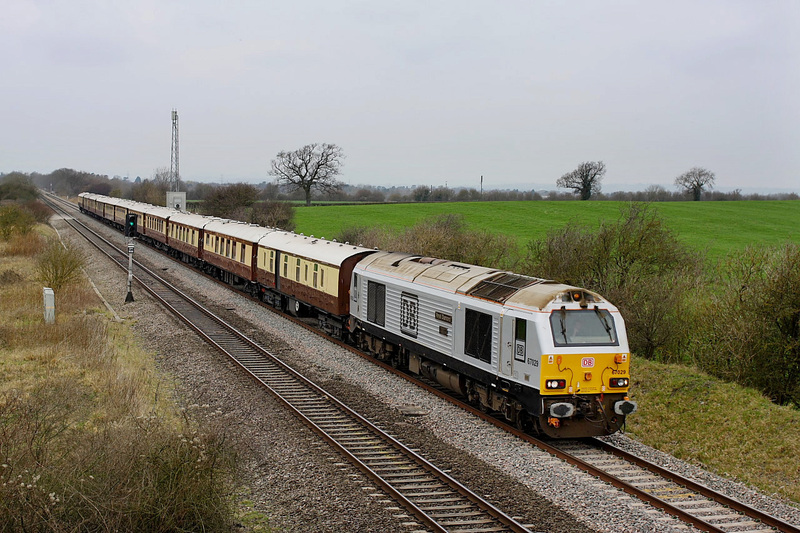 Sadly the passing of the Test-Train '1Z22' the 08:14 from Tyseley-LMD to Bristol via Weymouth didn't coincide with any sun even though it was a 50-50 chance it might happen! 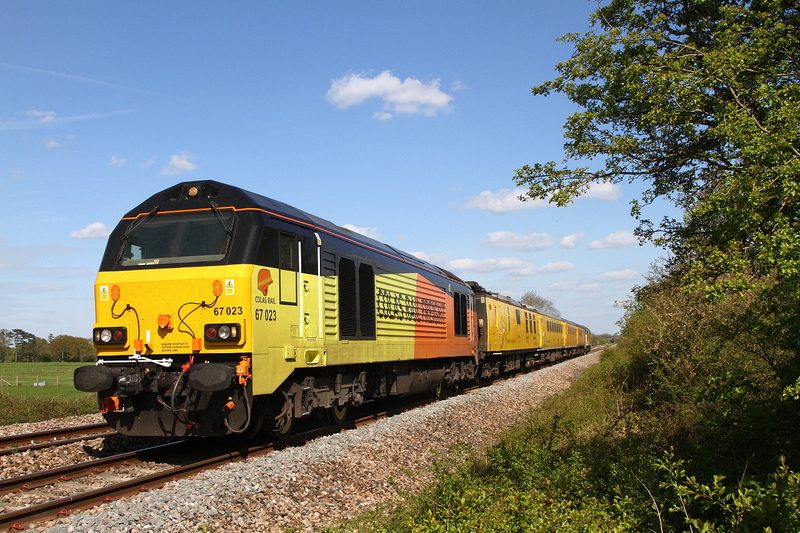 Here are 67023/67027 the Colas-2 running down the single line away from Frome Station at Feltham Lane.Despite how it looks I was actually on a public foot crossing.Lighting would have been just right if the sun had made its appearence but that's life! 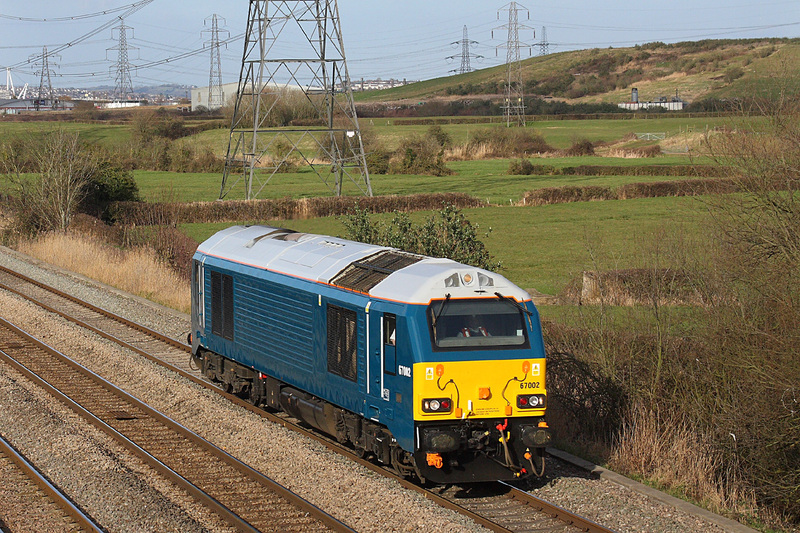 Today a Test-Train '1Z22' the 08:14 from Tyseley-L.M.D going to Bristol-HL Sdg's via Weymouth is seen in just a tinge of weak sunlight as it passes West Woodlands. 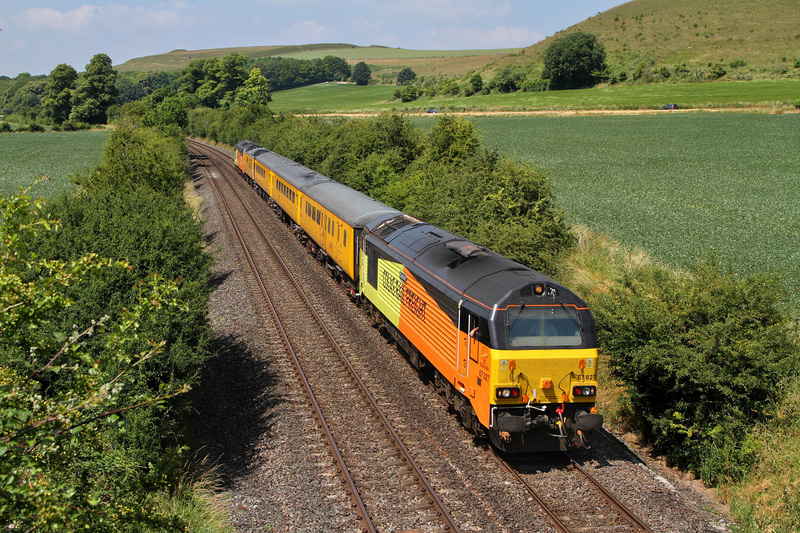 'Charlotte' 67027 led whilst its Colas partner 67023 'Stella' was doing rear-gunner. 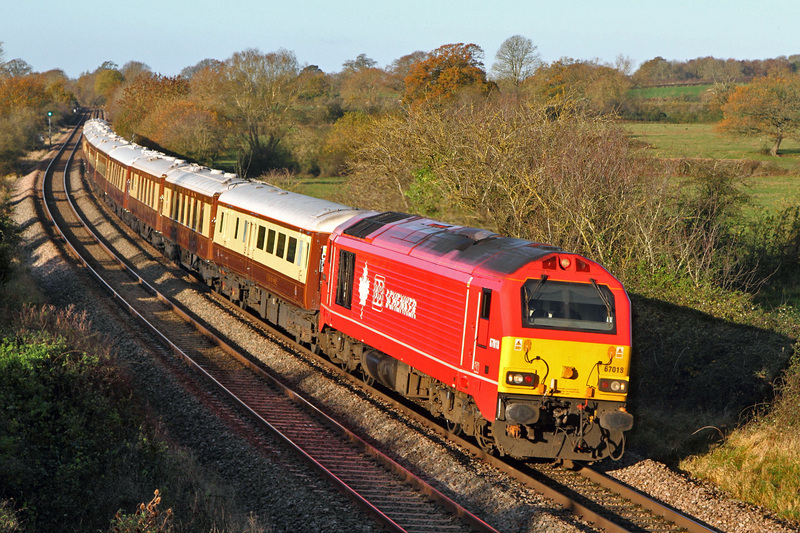 Here is another Excursion going to the Christmas Market in Bath Spa.This one passed here at Hawkeridge nr Westbury about an hour down on schedule due to being held at Salisbury. 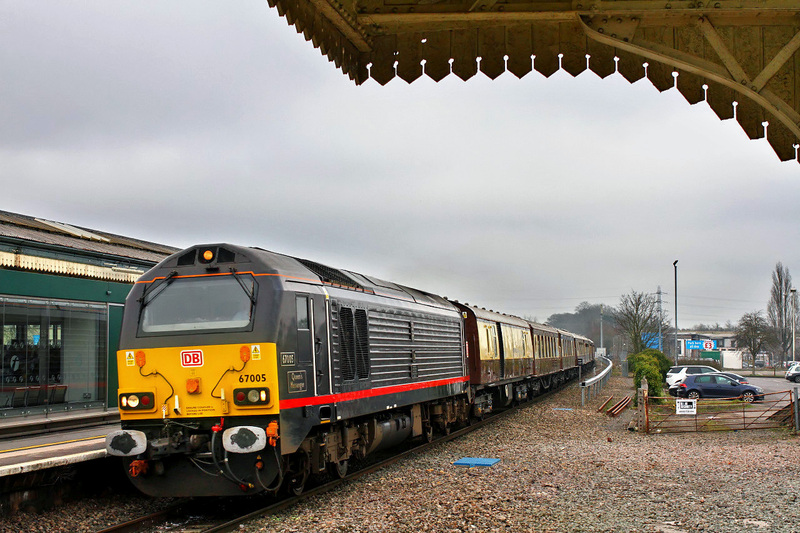 London-Victoria to Bath Spa.A similarly liveried 67024 being on the rear.This location was particularly dull requiring settings of 500th/sec@F4 using 1600-iso.Not too bad considering! 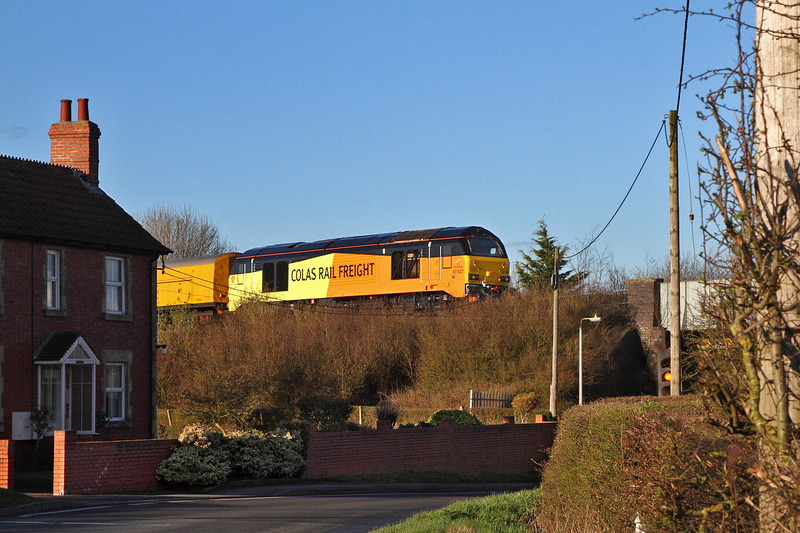 Final shot of Day-1 of November was of the 'Colas-2' 67023 and 67027 operating a Test-Train from Tyseley-LMD (08:14 off) to Bristol-HLS via Weymouth '1Z22'.Here seen approaching Clink Road-Jn taking the route via the Station there in Frome. 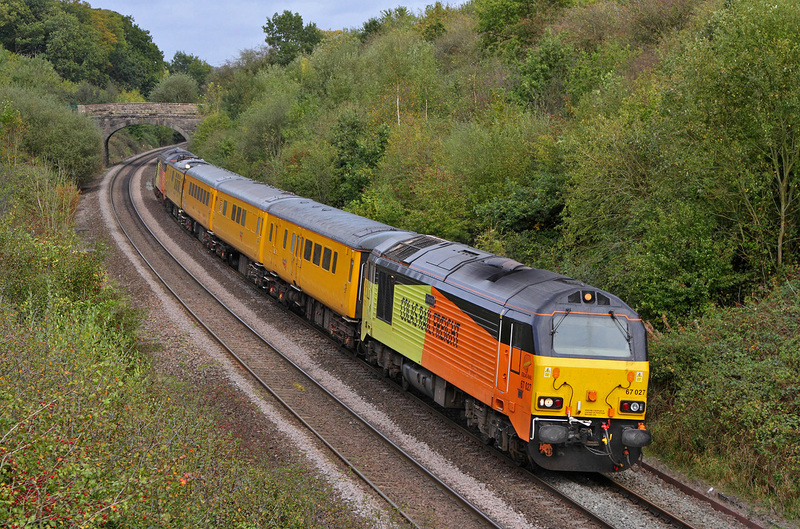 The 'Colas-2' 67027 'Charlotte' & 67023 'Stella' run as a pair of light-engines from Derby R.T.C (Network Rail) 11:51 off down to Cardiff Canton Sidings.I was rather hoping it would have a couple of coaches sandwiched between to loco's but it wasn't to be.Seen passing the colourful autumnal colour here at Undy in S-Wales. 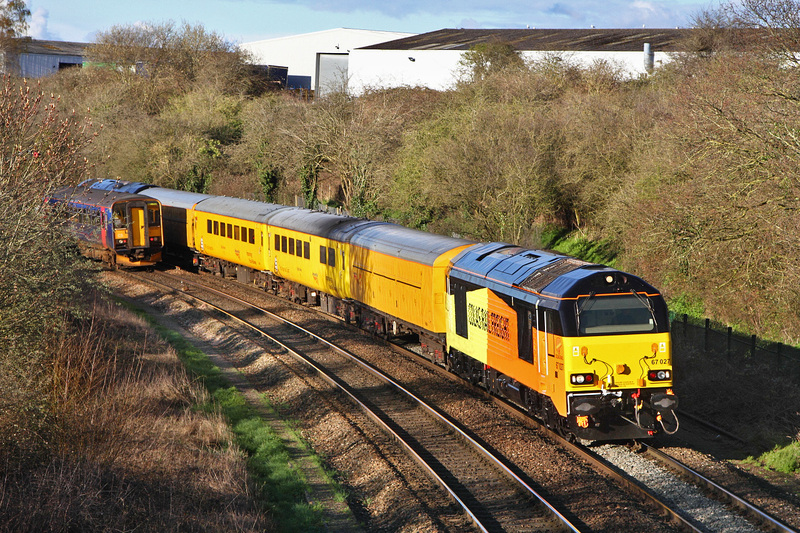 The Colas pair of Class-67's 67027/67023 today operated this test-train '1Z22' from Birmingham-Tyseley (08:14 off) to Bristol-TM via Weymouth.Here it is seen in rather indifferent lighting slowing for Clink Junction to gain access to the single line that runs via the station at Frome there. 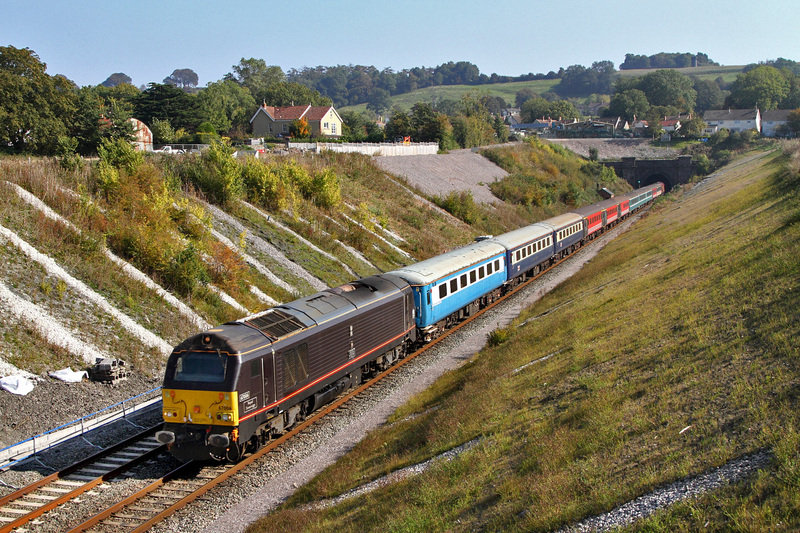 67021 brings up the rear of the rapidly disappearing '1Z91' Belmond Pullman from London-Victoria (09:29 off) to Bath Spa.67012 was the lead-loco.Note the curvature through the long disused main 'down' platform here at Chippenham.This station layout altered when HST's came into use to allow some services to pass through at full line speed.Crazily this platform with no track still has the 'stand well back' yellow lines as a safety precaution when trains are entering this platform.Something of a waste of time here me-thinks! Still in its base Silver&Grey livery from its days working out of Marylebone for the 'Wrexham&Shropshire/Chiltern' TOC 67012 speeds through Chippenham with '1Z91' the 09:29 from London-Victoria to Bath Spa Belmond-Pullman.Plain EWS liveried 67021 was on the rear.This will lead on the return leg later in the day. 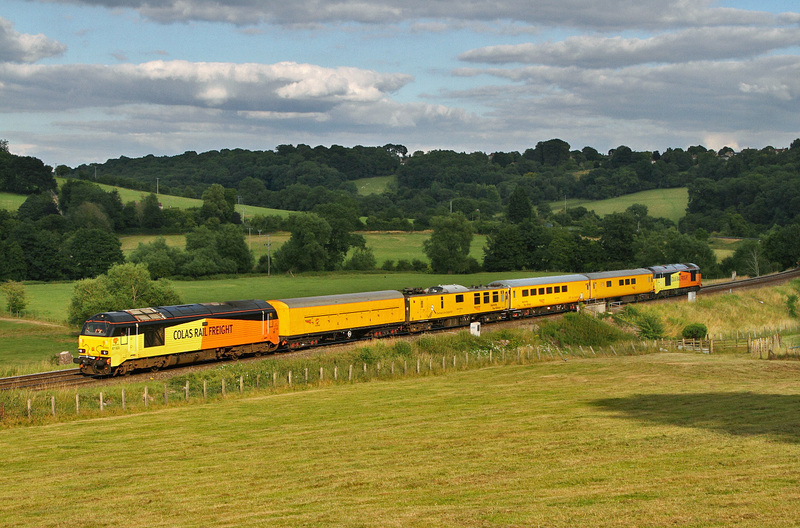 Today a Tyseley to Bristol Test-Train via Weymouth ran as '1Z22'.Here it is seen approaching Freshford in the Limpley-Stoke Valley.Colas's new toys 67023 and 67027 were doing the duty.It was supposed to reverse at Bath-Goods and then return to Westbury before finally going to Bristol.However that small segment of todays programme was omitted so this was its only 'pass' through here this evening. Wootton Bassett working was passing in the other direction somewhat making a bit of a mess of the background...Sod law stikes yet again! 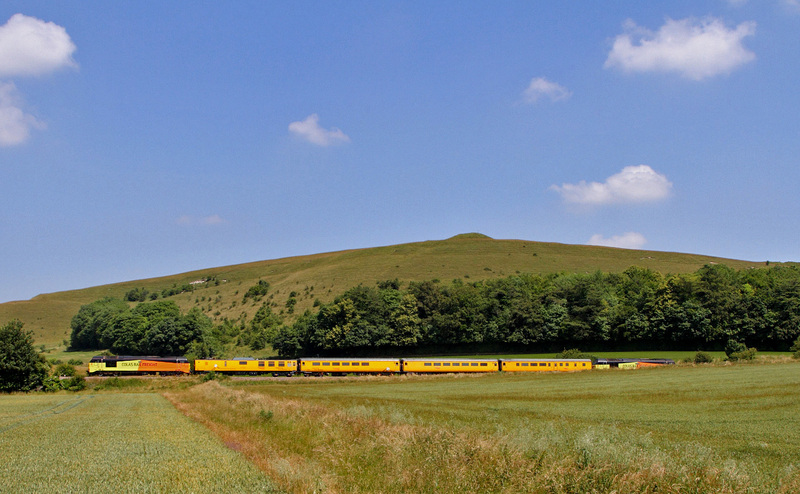 With Scratchbury Hill at Heytesbury forming the backdrop NR Test-Train working '1Q23' operated by 67023 'Stella' and 67027 'Charlotte' heads for todays journey's end at Salisbury.Have started at Reading Triangle Sidings at 05:46 this morning and been to Exeter-St-Davids via Basingstoke plus a short flip up to Westbury and return that will be it for todays 'testing'. 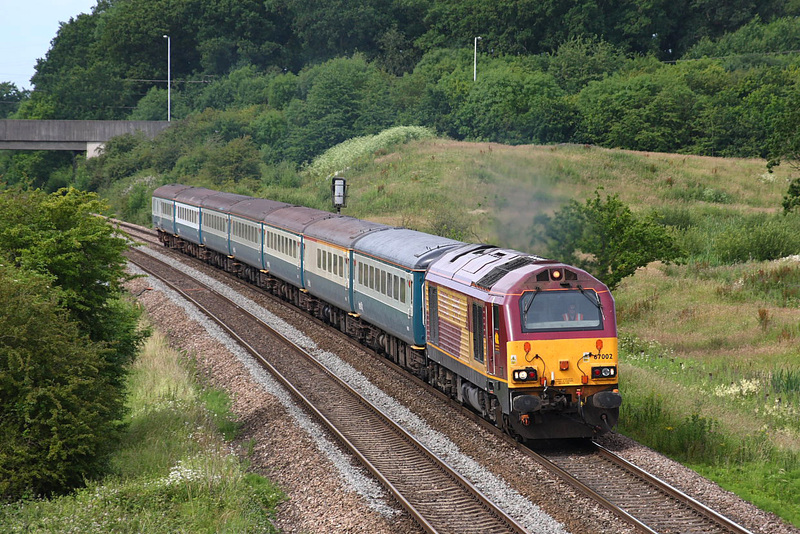 Note the well known test carriage 'Mentor-975091'' in the consist just behind 67023.Not much call for that one's capabilities around here for now and hopefully never! 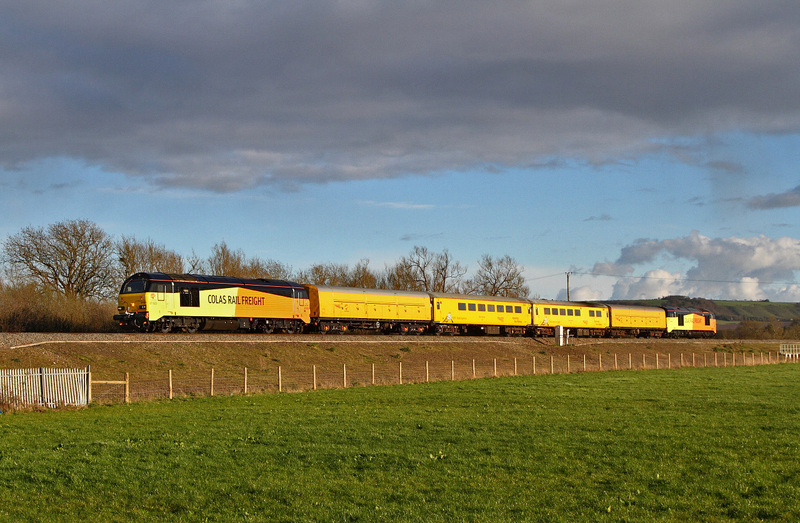 Another day,another NR Test-Train.This particular one is a temporary replacement for the NMT.The Colas pairing 67027 'Charlotte' and 67023 'Stella' (Is it named after one of the girls in the office or a famous brand of lager?) sandwich 4 NR test-cars including the infamous 'Mentor'. The working is '1Q23' the 05:46 from Reading Triangle Sidings to Salisbury via Basingstoke,the SR route to Exeter-St-Davids,back to Salisbury then a quick trip up to Westbury and return to its overnight destination Salisbury.Here it is seen on the leg to Westbury at Arn-Hill nr Warminster in dull albeit dry conditions. 'The Torbay Flyer',an excursion ran today from Letchworth (06:41 off) going to Paignton as '1Z14'. 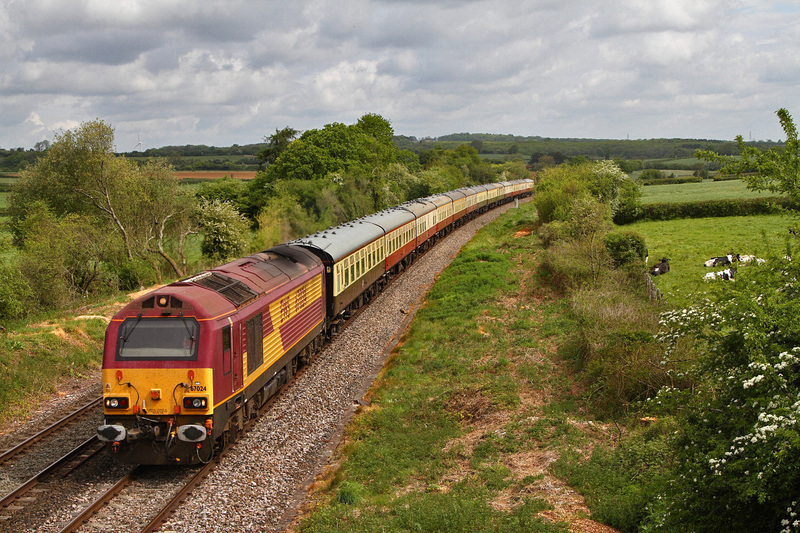 EWS-Spanish GM 67014 did the duty and is seen here just catching a glimmer of sunshine as it passes Strap Lane at Upton Noble just west of East Somerset Junction. 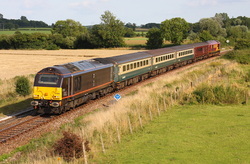 The 3-day long Belmond British Pullman finished its journeys around the West-Country by heading back to London-Victoria from Truro as '1Z33' departing there at 12:25.Not too many locations with the sun on the front end reasonably locally.I chose here at Ladydown nr Trowbridge.The other obvious location being Old Dilton south of Westbury but since I have already pictured several 'Pullmans' there over the years this shot seemed more appealing albeit with the rear of the train cut off along with the trailing 67006.Strangely i was wuite pleased that 67022 in old EWS colours was leading as it makes for a far more colourful shot c/w the now full bloom Hawthorn bushes in the background. 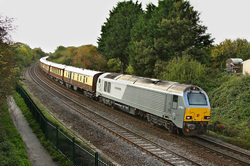 '1Z79' the 'Belmond Pullman' from Penzance to Bath-Spa sits 'held' at Fairwood nr Westbury awaiting a path through Westbury Station. 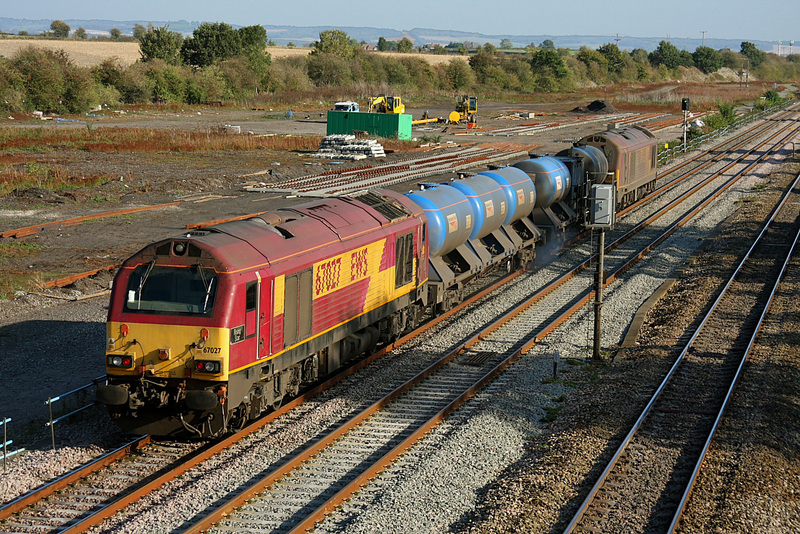 Annoyingly whilst it was stood here for about 15 minutes the sun was beating down quite nicely.Naturally when it eventually got on the move again the lighting failed.Oh-Well life goes on! 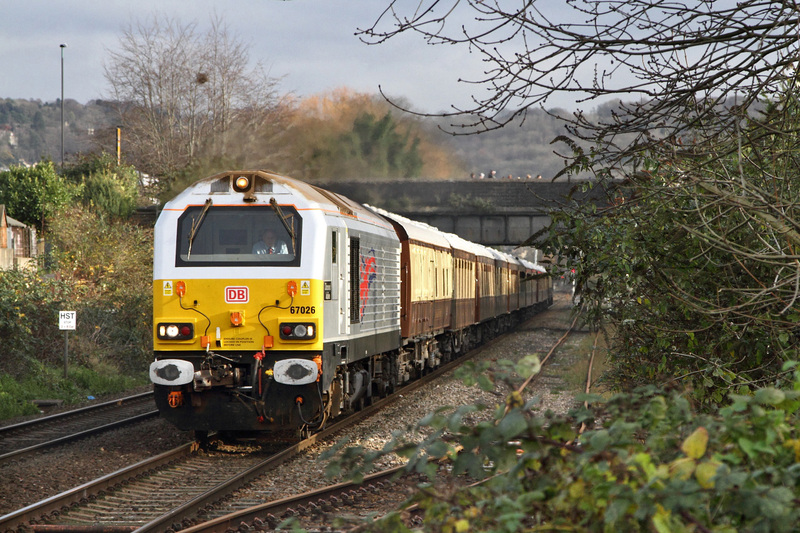 Loco's are 67006 leading with EWS-67022 tucked inside.Athough delayed here it still managed a RT arrival in Bath-Spa so the Grand+ per fare paying passenger were kept reasonably happy! 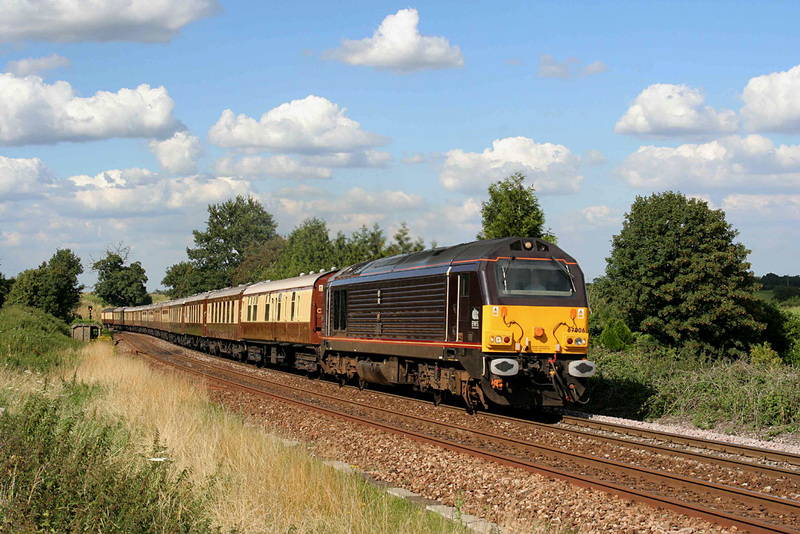 Doubleheader 67006/67022 slowly approach an adverse signal here at Fairwood on the approach to Westbury.This is of coarse the 'Belmond Pullman' working its very expensive 3-day tour down to Cornwall and return eventually to London-Victoria. This leg from Penzance/Truro was going to Bath-Spa as 1Z79' departing Penzance at 09:10.Apparantly the trip was a 'sell-out'-well it would be since tickets were a bargain £1130 per person.Not much more than a GWR 'walk-on' fare from Paddington to Penzance at a guess! Note the rusty set of wheels from an old Gangers-Trolley that have appeared on the trackside after probably being abandoned there over 2 decades ago! 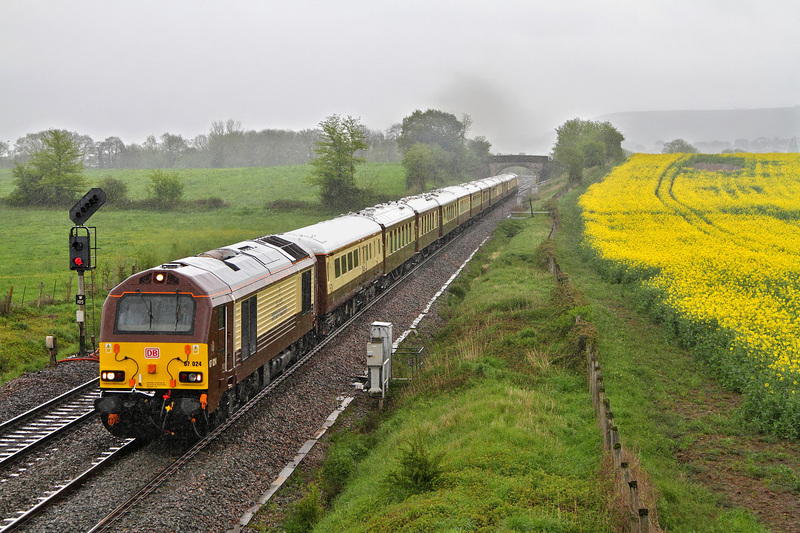 Today the Belmond-British Pullman '1V80' ran from London-Victoria (09:43' away) to Bath-Spa.The lead loco was 'Royal' 67006 but sadly the scudding clouds scuppered that shot.However the GAW with 67029 'Royal Diamond' was just about lit so that had to do.I actually prefer this loco livery anyway to the dark Royal colour.Sadly there was no shot either of the return working via Warminster at Dilton-Marsh later as once again the fast moving cloudbase did for me---again! 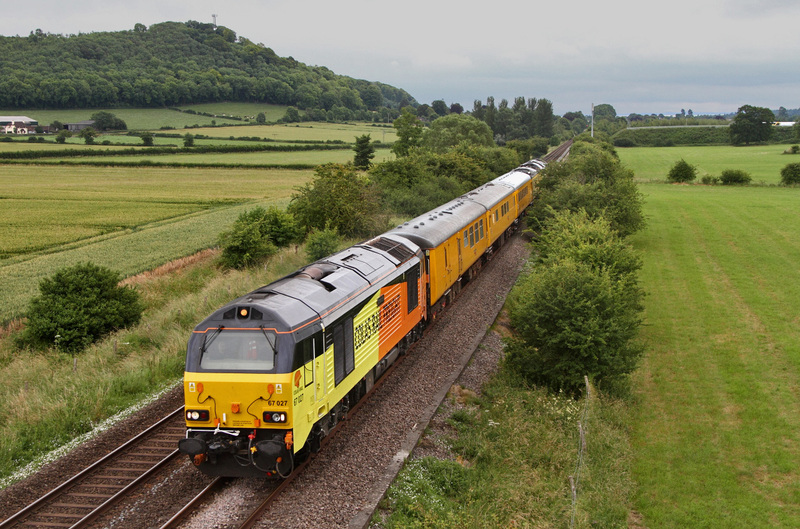 Todays '1Z22' Test-Train from Tyseley-L.M.D (08:14 off) going to Bristol via Weymouth passes Masters Crossing at Fairwood nr Westbury heading west.Newish Colas recruits 67023 was leading with 67027 on the rear.Originally I was going to go to Cole south of Bruton but this working having lost an hour off its schedule made that location a non starter due to the reduced sun-angle.Note the trains first coach is optmistically fitted with a pantagraph.Lets hope there is never a need for that piece of test-kit in this area! 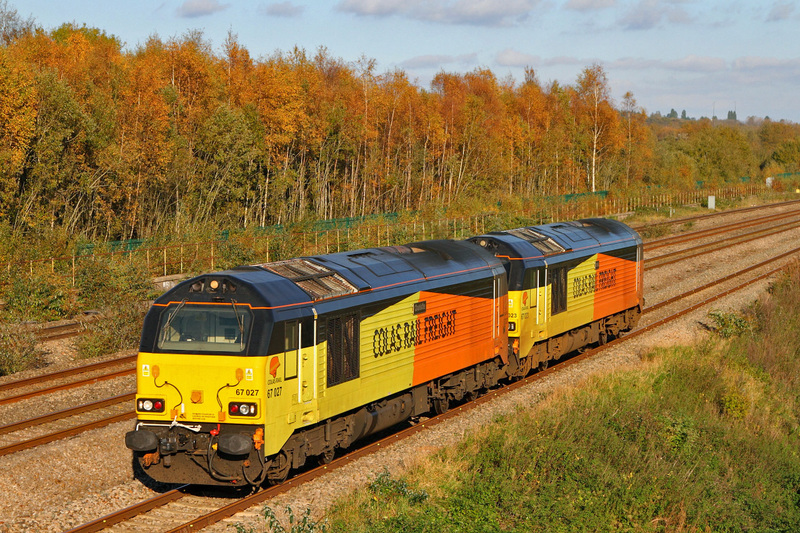 absorb both work and assets from the struggling DB-Cargo! 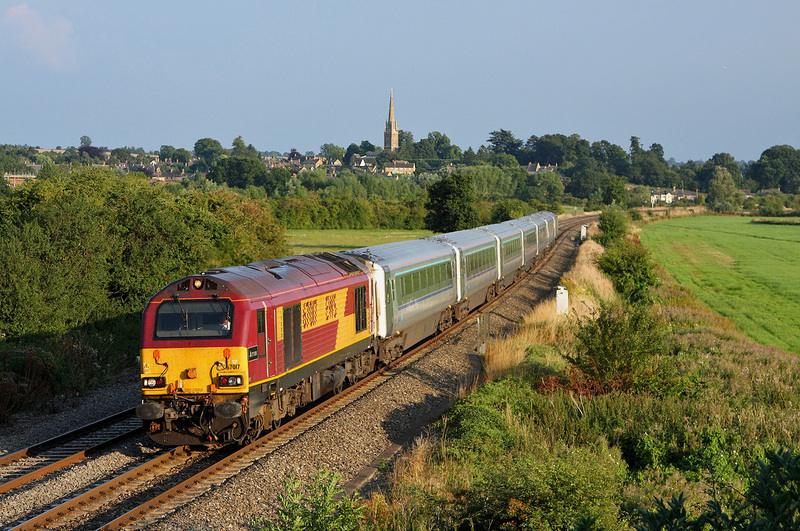 '1Z78' the 06:05 from Tyseley L.M.D to Bristol-High-Level reversed at Westbury and then headed back to Bristol after a short break there.Here it is passing Yarnbrook between Westbury and Trowbridge on the superbly clear embankment there where extensive embankment stablization work has recently taken place,hence the total lack of trees and bushes.67023 was now leading its equally immaculate partner 67027 as it passed.Note that this is only the second day of operation for this newly acquired pair of 67's by Colas from DB-Cargo. are quite difficult to photograph with shadow detail often lost in the deep blacks.However this one turned out fairly successfully. 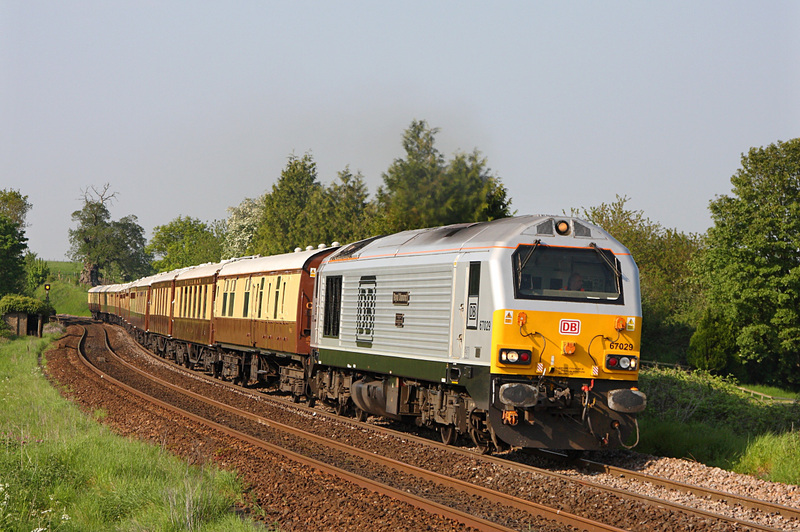 'Queen's Messenger' 67005 speeds through Chippenham with the Belmond-Pullman working '1Z91' the 09:43 from London-Victoria to Bath Spa.It's royal partner 67006 was on the rear.Note the revised lower striping now applied to this loco! 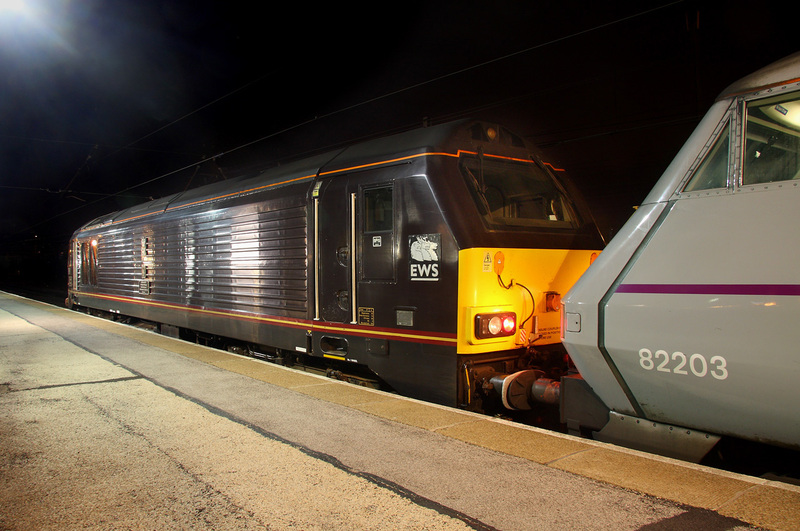 67006 'Royal Sovereign' still wears the cast alloy EWS 'heads rampant' emblem on its cabside even though that Company has changed its name twice since then! 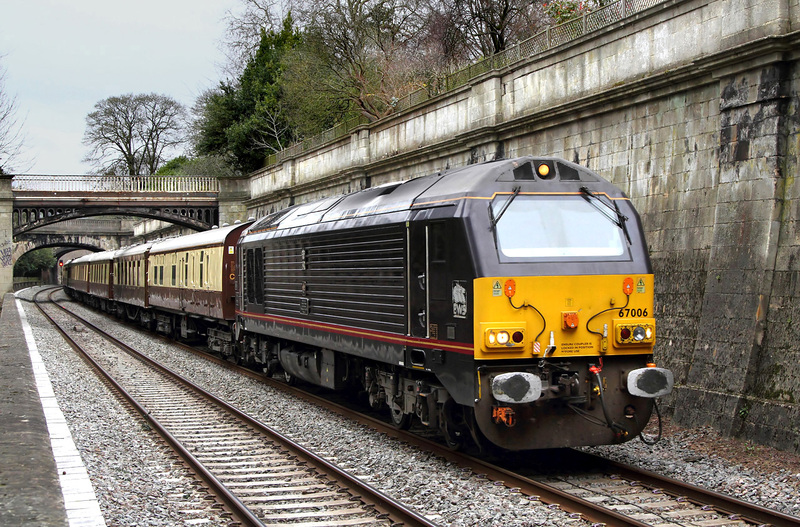 Here it is approaching Bath-Spa passing Sydney Gardens with the 'Belmond-Pullman' or as I prefer to still call it the 'VSOE' with '1Z67' the 09:25 from London-Victoria booked only as far as Bath.After disgorging its load of passengers it will then proceed on the Bristol as an ECS. 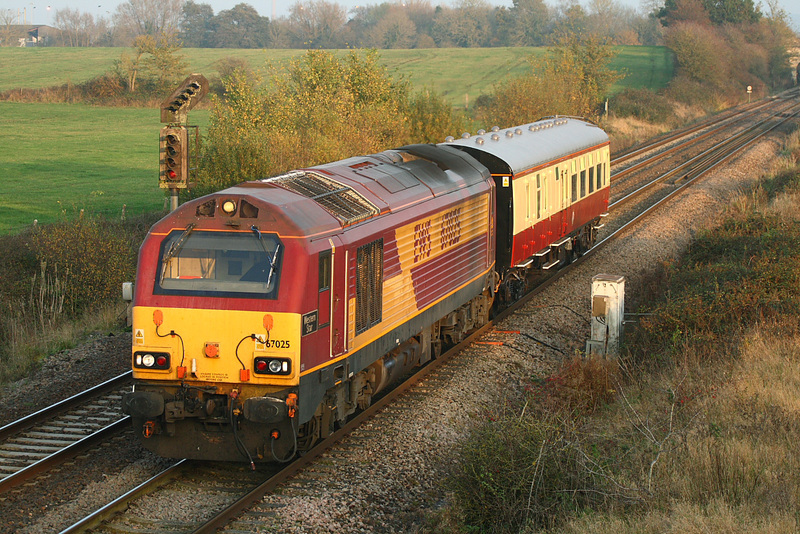 Another of the former Chiltern-Railways Class-67's has gained the Schenker-Red colour scheme now that it has been returned from duties for that Company having been replaced by Class-68's. Here is 67015 bringing up the rear of the ECS '5V81' from Bath-Spa to Bristol East Yard. 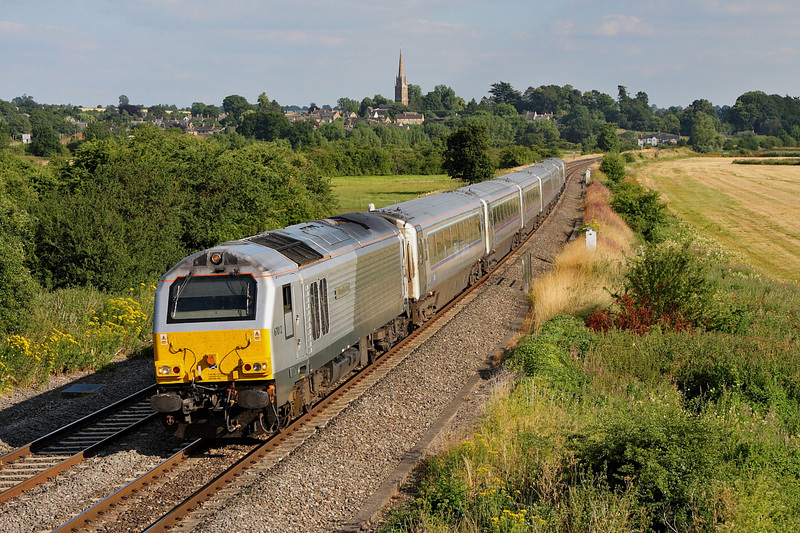 67018 led the Belmond-Pullman working from London-Victoria to Bath and this loco will do the return leg this evening.It is seen passing Oldfield Park shortly after departing Bath-Spa. 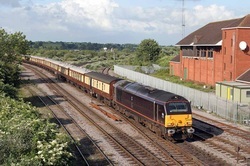 The 'Maple Leaf' adorned 67018 carrying the name of 'Keith Heller' who was a former CEO of D B Schenker in this country heads the ECS from Bath-Spa to Bristol East Depot presumably '5V81'.It had just discharged its passengers off of the Belmond-Pullman '1V80' the 09:43 from London-Victoria.No doubt they will all be making for the Christmas markets currently in full swing in the City-Centre.Here seen approaching Oldfield park in the western suburbs of the city of Bath Another Schenker-Red loco 67015 was tagged on the rear.This loco will do the return leg later in the day. 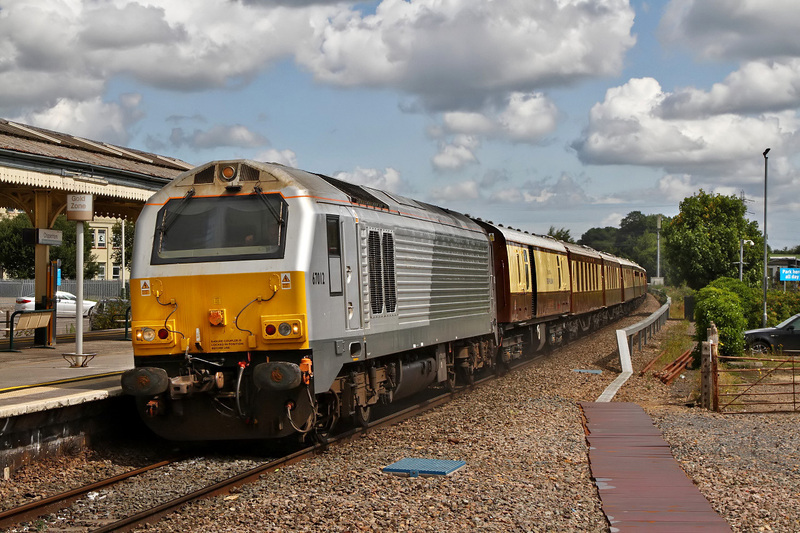 This was something of a surprise working,'1Z16' a Belmond-Pullman working from Bristol-Temple Meads (09:10 off) going to London-Victoria.Usually this train originates from London and goes to Bristol so this was a pleasant change.It enabled the working to be pictured at a location where it normally cannot be due to sun-angles etc. 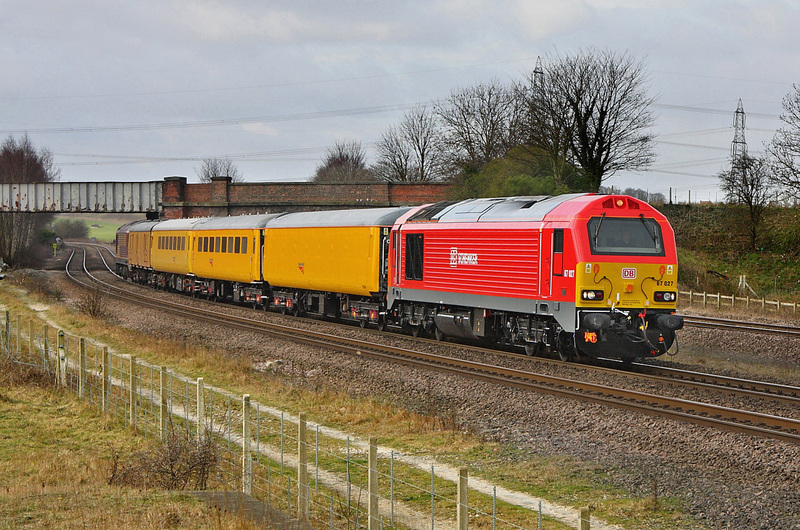 So here is 67018 'Keith Heller' in its unique Schenker/Maple-Leaf livery passing Great Cheverell on its run up to London Victoria.Certainly a change from the usual 59's and HST's that infest this route day after day! 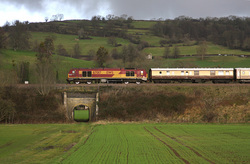 portal of Chipping Sodbury Tunnel east of Bristol Parkway. Cardiff is seen at Chipping Sodbury.The match was between New Zealand and Georgia with a KO of 20:00 so plenty of time for a few pints of ale! ​ The game ended with NZ winning by a 43 to 10 margin! 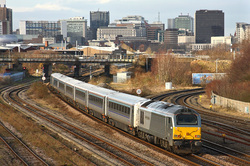 The third and final 'Extra' from Paddington to Cardiff was '1Z32' which departed at 12:33 from the capital. 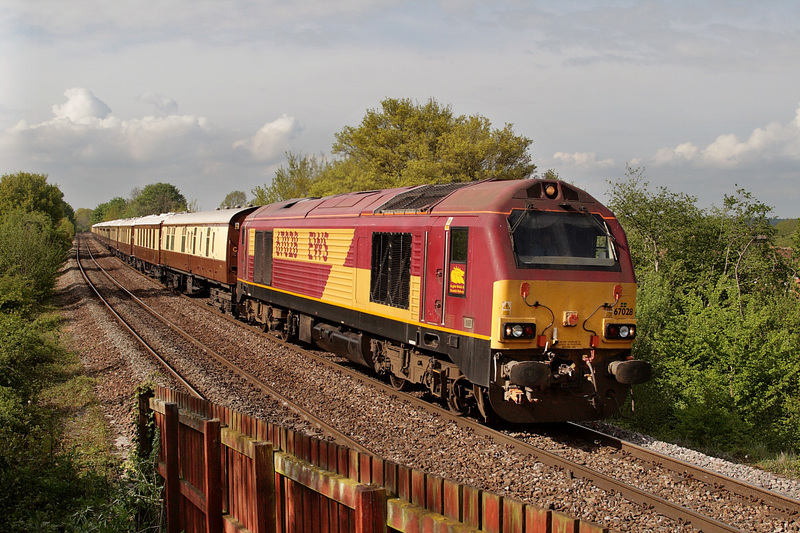 EWS-67008 was leading with the latest Schecker-Red 67013 sadly invisable tagged onto the rear.The stock for this one was a really faded set of old Anglia and Virgin-Red stock although the bogies looked as if they had had a bit of an overhaul recently! 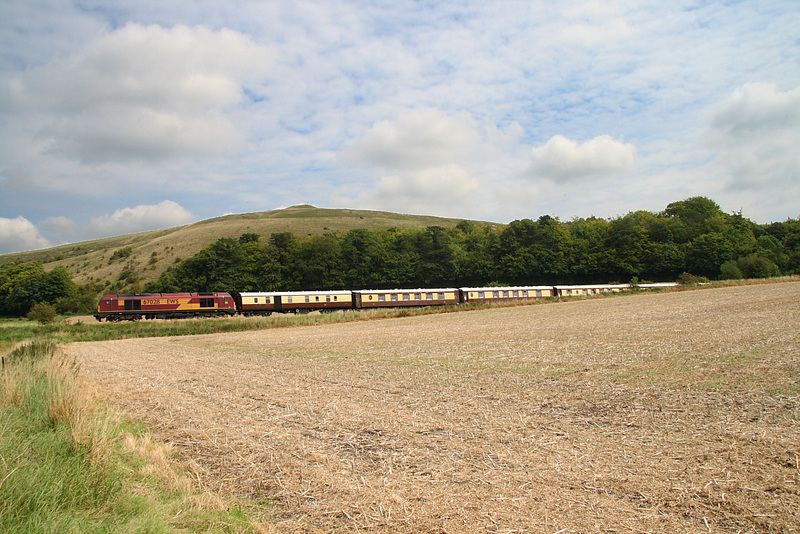 Location was again Acton-Turville. 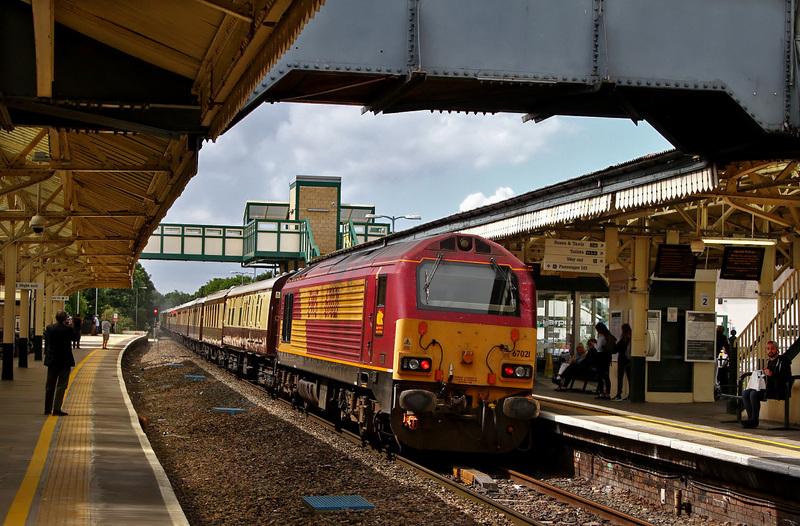 ​' World-Cup Rugby again today at the Millennium Stadium in Cardiff between Wales and Fiji.Here is todays loco-hauled extra No-1 '1Z30 the 10:33 from Paddington to Cardiff-Central. 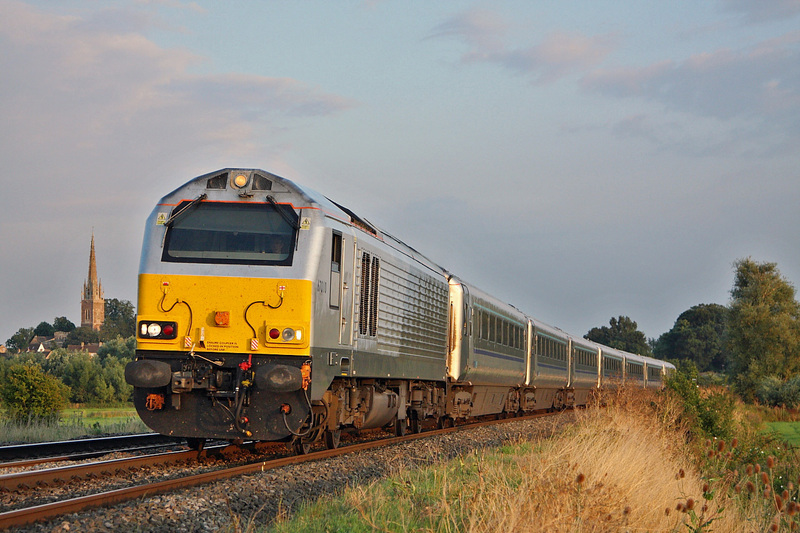 Originally I was going to give this earlier one a miss due to the light not being on the front-end at the booked time.Luckily this working was 25 minutes late and I was 25 minutes early so just got here with a minute to spare.The added bonus being the sun was now on the front!. 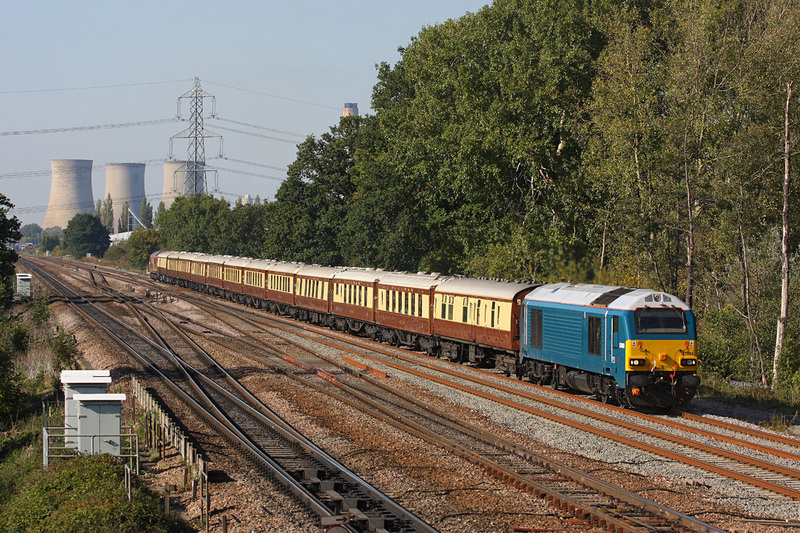 So here is 67006 'Royal Sovereign' with an out of sight 67023 on the rear speeding through Acton-Turville in the sunshine.A nice mix of Pullman/Great Britain and Virgin stock on this special. The very recently reliveried/repainted and reinstated Schenker-Red 67013 today led '1Z17' the 11:12 from Paddington to Cardiff-Central.67029 was the invisable helper on the rear.Unlike the immaculate loco the stock was a set of very careworn and faded ex-Anglia and ex-Virgin Mk-2 stock dragged out of store at Burton a few days ago.Seen at Long Dyke Junction approaching journeys end at Cardiff. 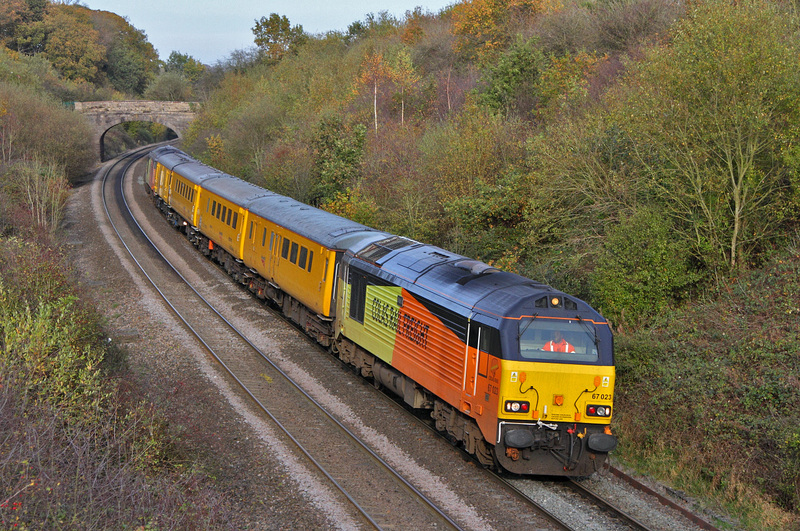 'Royal Sovereign' 67006 leads '1Z10' the 07:15 excursion from Paddington going to Cardiff-Central with a crowd of Rugby supporters going to see a game between Ireland and Canada on the opening weekend of this years Rugby-World Cup being held in this country.67008 was on the rear as it passed Newport-Alexander Dock Junction Yard in weak sunshine as the morning mist was just starting to lift. With the clouds finally break-up rather later than the BBC had predicted (Nothing new there!) it was decided to go for the returning Railtour '1Z15' the 17:38 away from Paignton returning to Northampton.This spot at Cullompton was chosen as being about the best sun-angle available given the time of day.Here is 'Royal Diamond' 67029 heading north adjacent to the now largely obscured M5 Motorway nicely catching the now rapidly yellowing low evening sunlight. 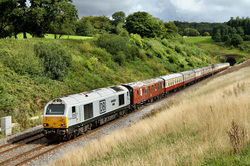 DB-Schenker's Flagship loco 67029 'Royal Diamond' today operated a Railtour from Northampton (07:10 off) down to Paignton as '1Z14'.It is pictured in a fleeting patchy patch of weak sunlight exiting Whiteball Tunnel in deepest Somerset.Amazingly this location is still remarkably clear of rampant vegetation due to a long program of bank stablization and drainage work at this location. 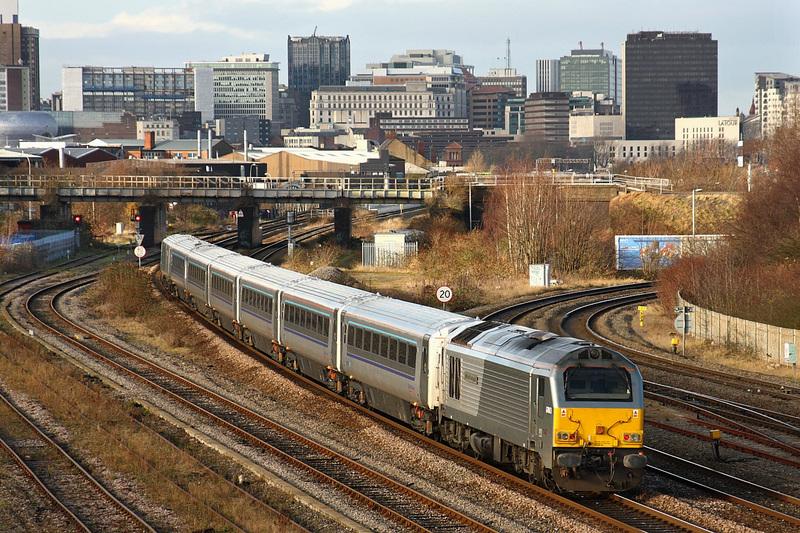 With 67008 leading and 67023 on the rear '1Z21' an NMT substitute heads back to Derby-RTC from Paddington after a days running in the south. After 2 days away in the Midlands I had pretty much exhausted my supply of CF-cards,this in fact was actually the final frame on my final card! 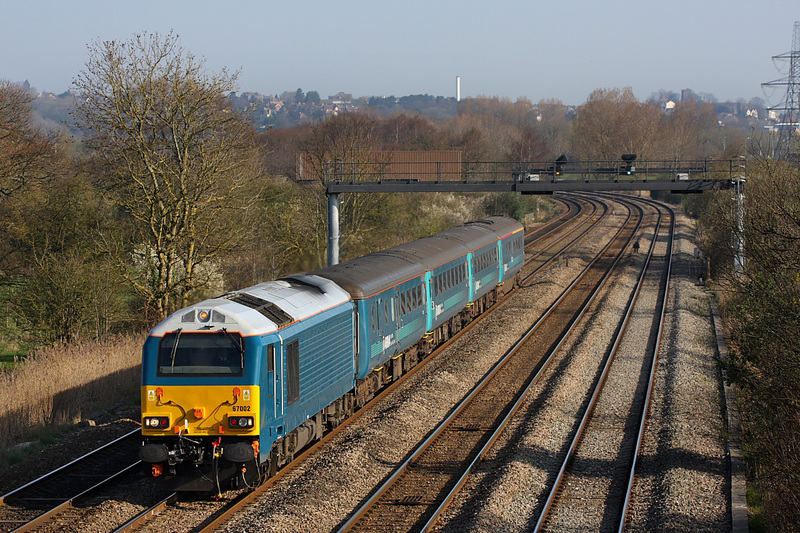 For some reason this so-called 'dedicated' to Arriva-Trains-Wales loco 67003 has now for sometime been the Didcot-Dogsbody doing various local duties.Today it seems it was on a Route-Learner having gone down to Bradford-Junction nr Trowbridge and return (13:42 off). 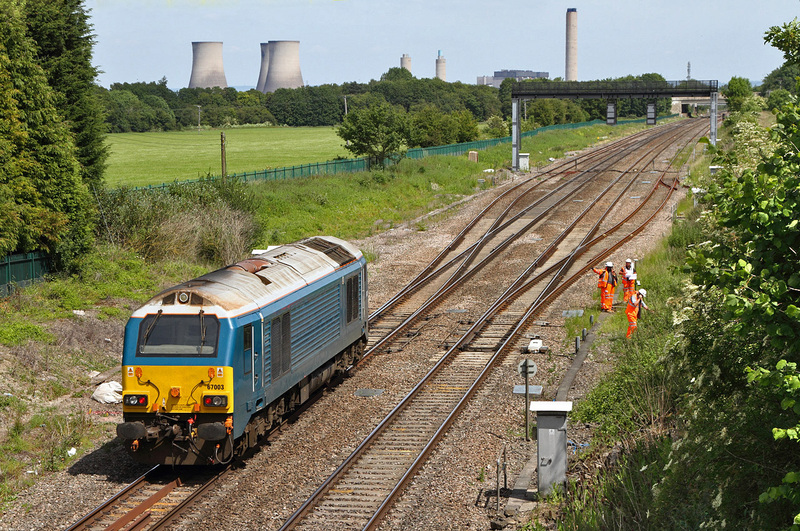 Dunno the report code so lets call it '0Z67'.Here it is just entering the loops at Steventon whilst a bunch of Network-Rail personnel pretend to look busy waving their hands and making mobile phone calls.Other than that they did 'Bug-All' during the near hour I was watching them.No wonder the Electrification scheme is way over budget having gangs like this producing precisely nowt! Here is the returning leg of todays 'Belmond British Pullman' from Bath Spa back to London-Victoria.It departed Bath as '1O92'.A particularly dull day as usual when something out of the ordinary to booked to pass through the area! So this is a rather faded 67008 still carrying EWS indentification with its set of classic Pullman coaches plus an ex-Chiltern loco 67014 on the rear.Here it is passing the village of Heywood on the approach to Westbury.Pictured from a very convenient and recently well cut-back foot-crossing. 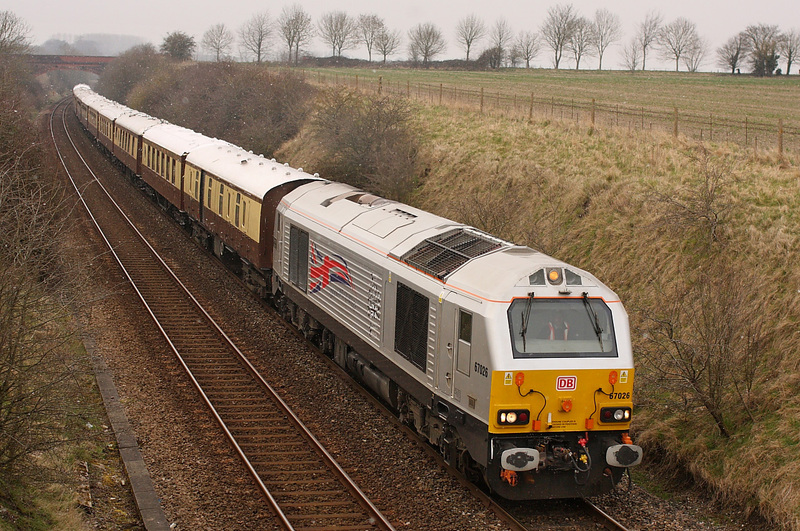 Although not quite in immaculate condition Silver-67026 'Diamond Jubilee' c/w its stylistic Union-Jack logo still makes a fine sight hauling '1Z83' the 12:20 from Truro to London-Victoria.Here it is attacking the Upton-Scudamore Incline shortly after passing Dilton-Marsh.Another 'Royal' 67005 was on the rear but was not involved in helping the train engine up this rather steep bank. Luck was on my side as the brief patch of very acceptable sunlight came and went nicely coinciding with the passing of this colourful working. 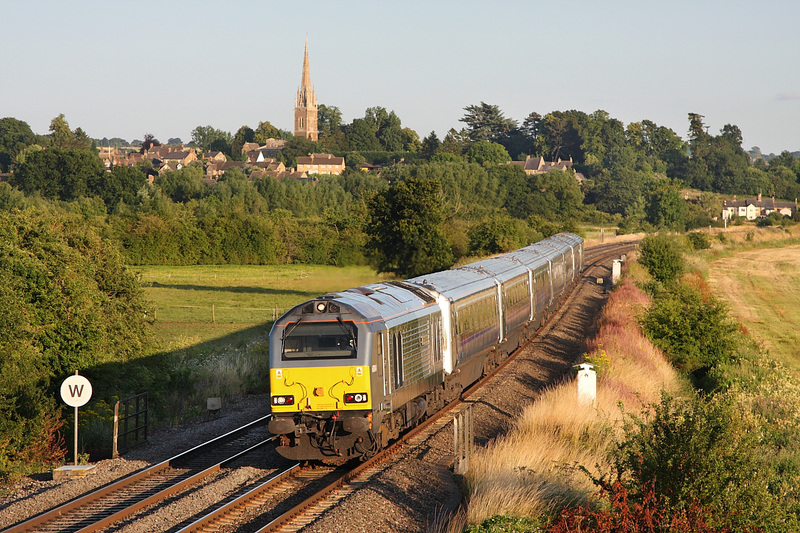 This is the second weekend running this superbly appointed train (The VSOE) has passed through Westbury heading for London-Victoria.I missed last weeks performance (Unlike somebody on Westbury Station Bridge-Nice shot by the way!) 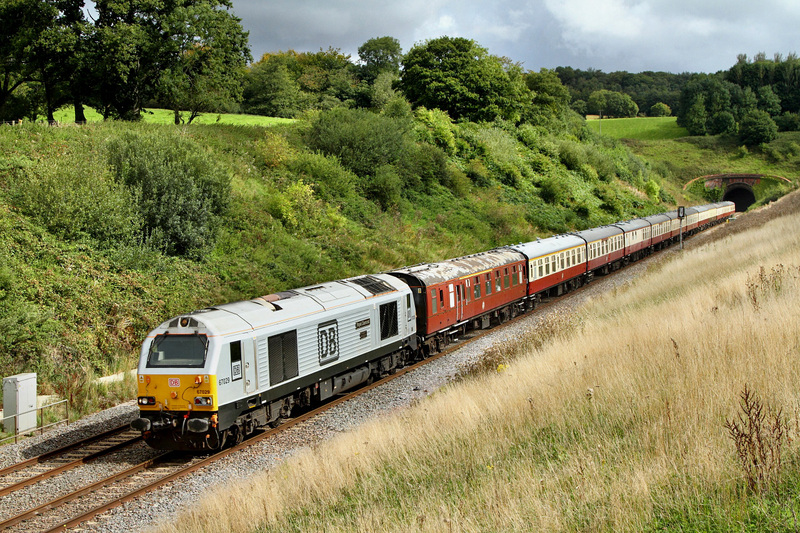 due to having a few days 'Up North' picturing various workings around Barnetby-etc.So I was rather pleased when 67026 put in this 2nd appearance so shortly after the last one,particularly as I managed to grab a shot or two in full light here at Old-Dilton as the train '1Z83' the 12:20 from Truro powered by on the Upton-Scudamore Incline.67005 was on the rear but wasn't doing any work. 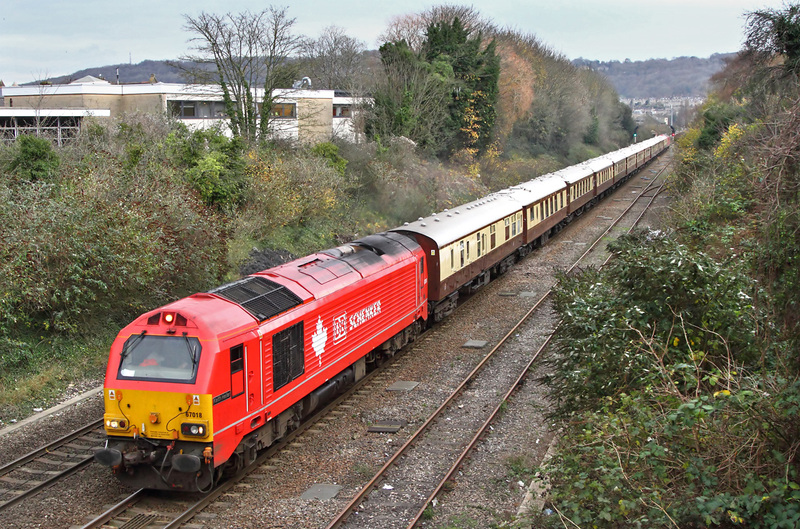 After nearly 2 weeks of virtually unbroken sunshine today proved to be somewhat dull,hence this rather flat shot of '1Z05' the 11:10 from Torquay going to Ealing Broadway.It is of coarse the DBS Executive Management Train being hauled by 67029 'Royal Diamond' with 3 mk-3 coaches and DVT 82146 on the rear.As it passed everybody inside was sat down enjoying a full lunch after a day/night at the seaside.--Note ----No aircraft style seating in this train! It is viewed passing Fairwood on the approach to Westbury. 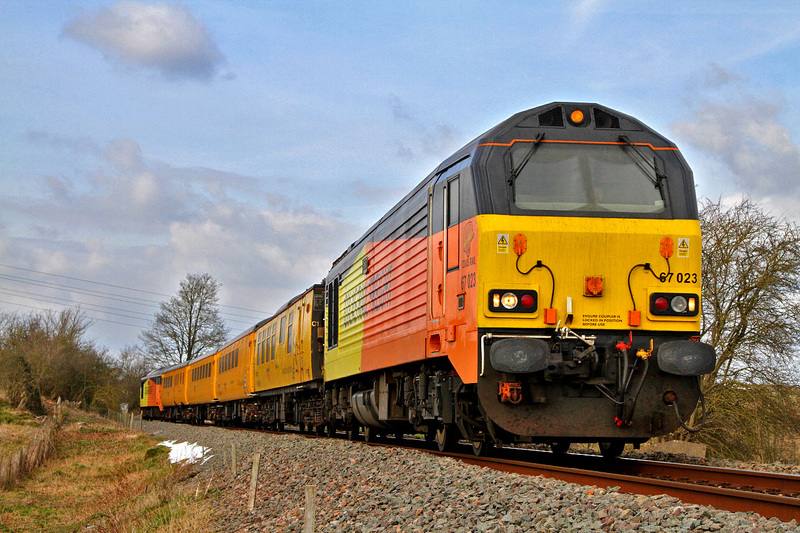 At last after 4 hours of waiting an diverted ECML 'Electric' working finally passed Chuch Fenton out from under the wires albeit with a DVT behind the Diesel.The train was '1E20' the 15:00 from Edinburgh to Kings Cross.A rather faded EWS liveried 67024 was hauling DVT-82222 with a regretfully unseen 91107 'Skyfall' in the rear.The coaches are still labelled as East Coast whilst the DVT has a Virgin-Flash but the Class-91 was still in EC style. 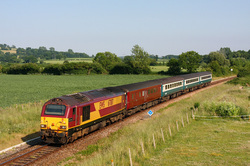 This working is normally the preserve of the 'New Measurement Train' Network-Rails HST based Test Train.However today for some reasom '1Q23' was given over to a pair of 67's and just a couple of test coaches.Anyway 67027 failed earlier in the diagram so 67012 continued solo.Thus providing the unusual sight we see here. 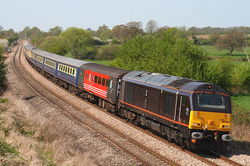 67012 'A Shropshire Lad' leads just a pair of Mk-2 test coaches on the climb past Upton Scudamore returning from Westbury on the 15:06 from Salisbury to OOC-HSTD via Westbury/Salisbury/Basingstoke/Reading then OOC.I suppose the reason this loco is on this type of working now is because it has been made redundant on the Chiltern line by the brand new Class-68's. 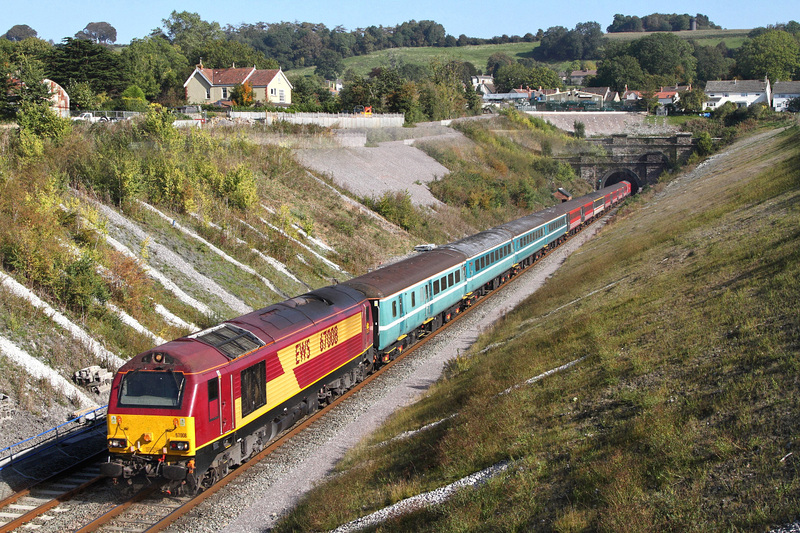 The VSOE '1Z80' ran today from London-Victoria (09:43 off) to Bath-Spa.After depositing its passengers in Bath it then proceeded as an ECS (Presumably '5Z80') to Bristol-East Depot of stabling until this evenings return leg back to Victoria.Here is 67026 'Diamond Jubilee' with an invisible 67005 on the rear passing Oldfield Park with that ECS.The platforms here were very crowded with people waiting to view the double headed Black-5 steam special headed 'Cathedrals Express' which was just 10 minutes behind this working. With the silver-end leading 67013 'Dyfrbont Pontcysyllte' (or Pontcysyllte Aqueduct' in english if you prefer) heads the 18:47 from London's Marylebone to Kidderminster service '1K65' past Kings Sutton in the late evening yellowing sunshine. This was the final shot taken on a long long day stretching from 04:30 in the morning until 23:00 (18.5 hours) that evening.To say I was somewhat fatigued is an under statement! 67014 'Thomas Telford' on the 18:15 from marylebome to Kidderminster passes in the sun at Kings Sutton c/w a matching set of mk-3 coaches.Chiltern certain see a future in loco-haulage as they have gone to the high expense of converting their hauled carriage stock to automatic door opening.a not inconsiderable investment! 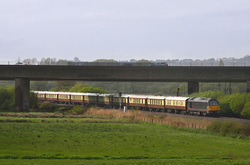 The '1Z81' VSOE that had earlier gone to Exeter to reverse before continuing on down to Kingswear from Newton-Abbot emerges out from under the M5 Motorway in an all to brief splash of weak evening sunlight at Gissons in Exminster. 67005 was leading leaving an out of sight 67024 on the rear.This set up will make things much easier for the return leg away from Kingswear later. 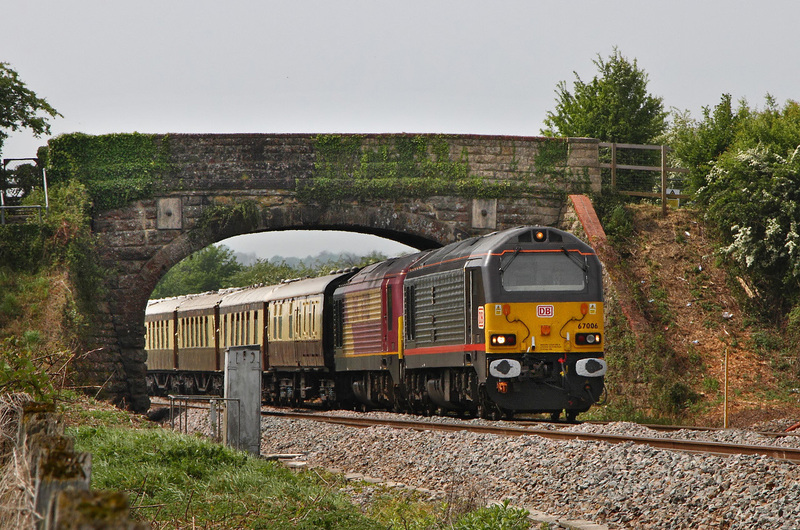 With the entire Sea-Wall from Teignmouth to Dawlish Warren closed for storm damage repairs Starcross Station was chosen to picture the VSOE on yet another leg of its Day-Cruise around Devon.This section '1Z81' being '17:30' from Newton-Abbot to Kingswear via Exeter (rev). Camera settings of 800th at F2.5 using a 35mm F2 lens @ 800asa kinda says it all. Result was quite acceptable considering although holding an umbrella and shooting with one hand in a gale and rainstorm can be quite tricky! 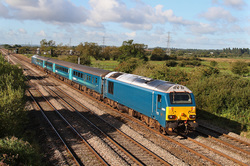 Loco's 67006/67024 are seen passing the soaked and windswept platforms at Starcross. 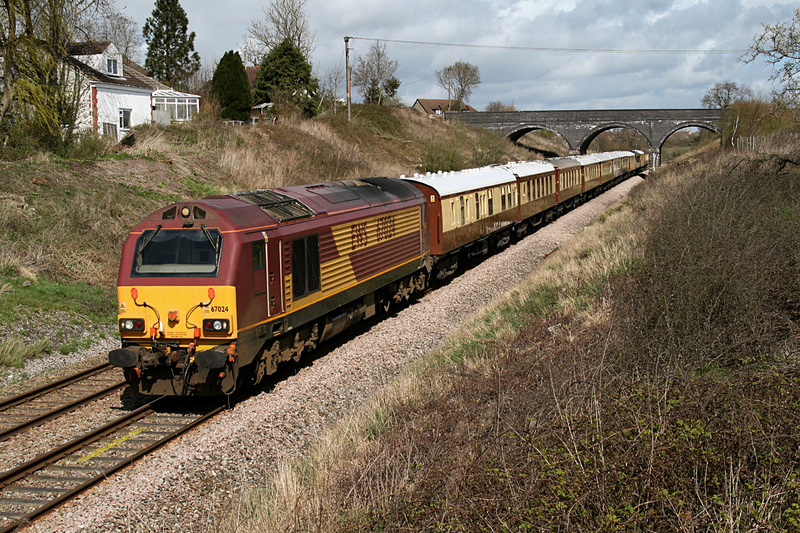 It may be a bit of a squeeze but a reasonably acceptable shot can be had though the littice work of the girder bridge at Silk Mills west of Taunton.This structure replaced a very busy level-crossing just under a decade ago. Here is '1Z79' the 11:30 from Plymouth going only as far a Taunton before reversing and returning to Plymouth. 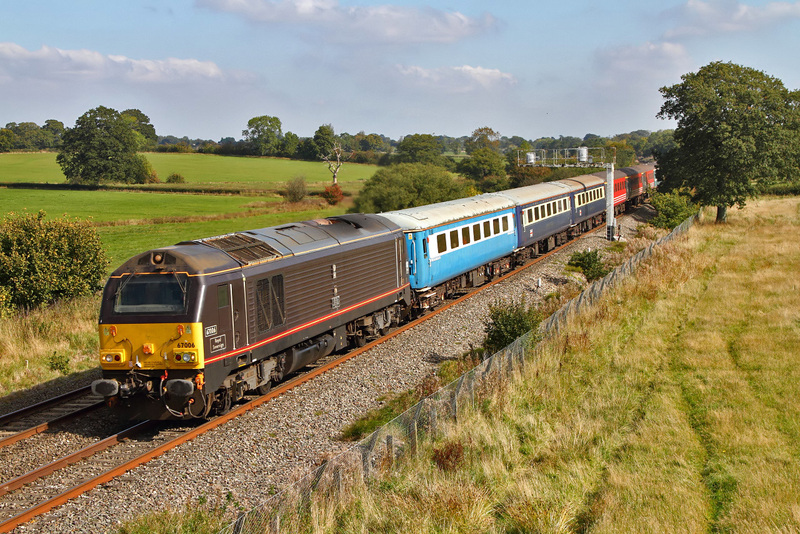 67006 and 67024 were leading this mega weekend junket.Tickets for this luxury weekend apparantly were £1000 each....Recession?---What Recession! 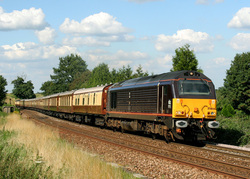 '1E21' the 15:30 from Edinburgh required the help of a drag locomotive between York and Doncaster as it was diverted via Milford-Junction due to engineer work north of Doncaster.Here it is shortly after arrival at Doncaster where the 'Royal' 67005 (Its job done) will be removed and the set headed by 82203 will again proceed unassisted under the 25kva wires. Having one of its first trips out in traffic since receiving its repaint into Schenker-Red was 67027 on this Test-Train '1Q33' with 67020 on the rear.Travelling from Derby-RTC and going to Heaton-CS the painfully bright Skip is seen passing Burton Salmon heading East.Techically this is the first '67' to get this livery.
' 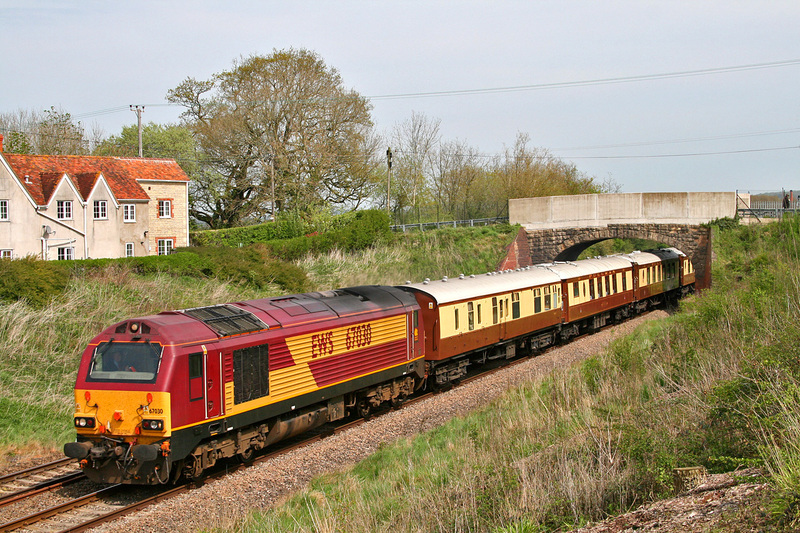 Keith Heller' 67018 doesn't really qualify as it was decaled as 'Maple Leaf' and the loco colour although very close, was in fact Canadian Pacific-Red instead! 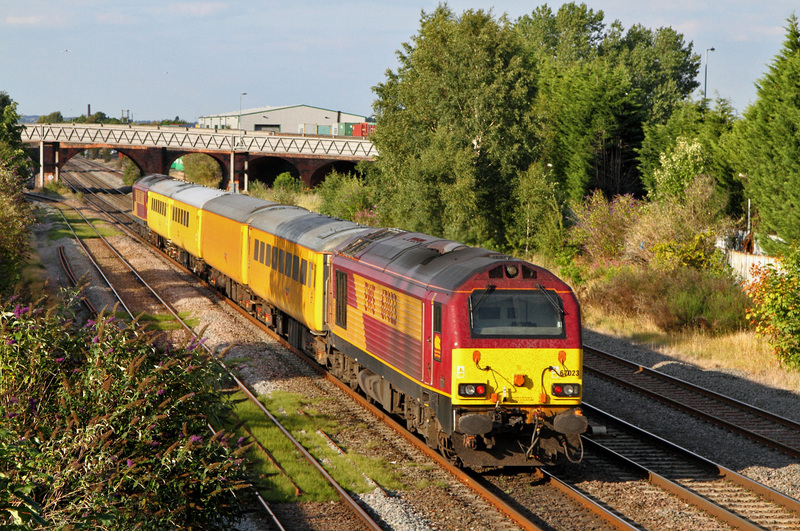 Un-named 67010 with DVT 82302 on the rear sweeps past the foot crossing just north of Kings Sutton station with '1R54' the 18:33 from Marylabone going to Birmingham Moor Street. 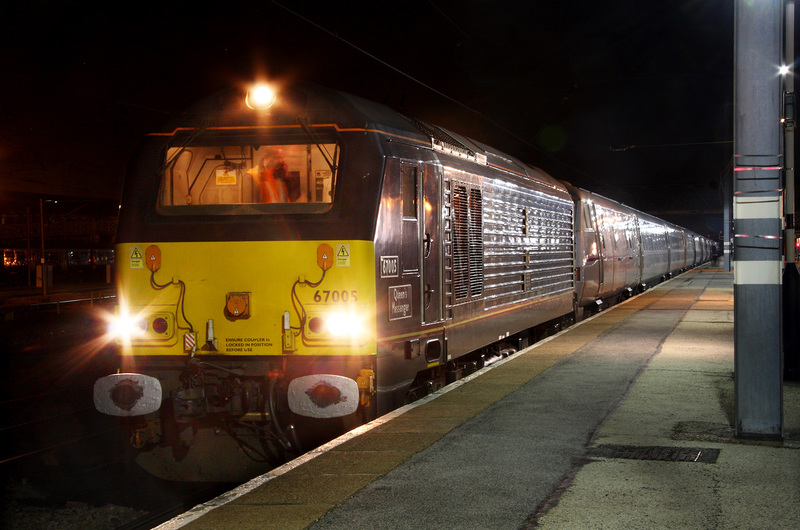 Tonight I must have been on a roll as just 60 minutes after the DRS/Pretendolino passed in full sun so did this! 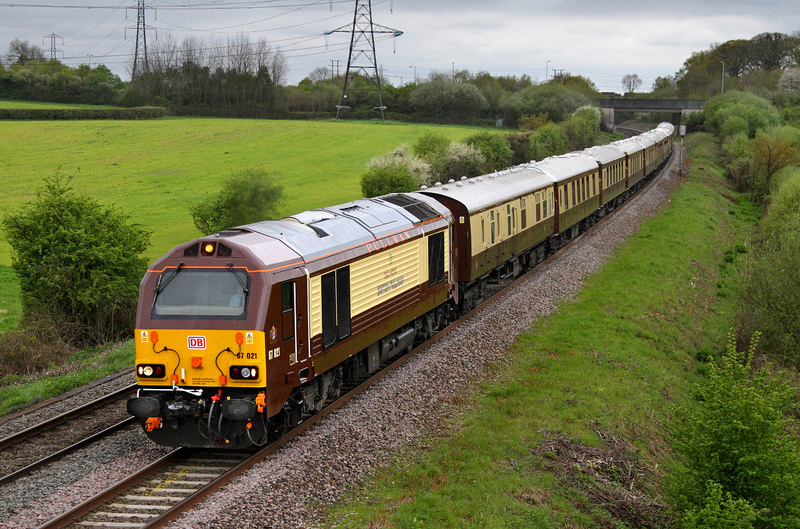 EWS 67017 'Arrow' with its full liveried set of Chiltern Mk-3's+DVT 82304 were working '1R50' the 17:33 from London Marylabone to Birmingham Moor Street.Today two loco hauled sets were out shuttling up and down from London all day,presumably to increase capacity whilst the WCML blockade over the weekend was on. Location is of course Kings Sutton south of Banbury. 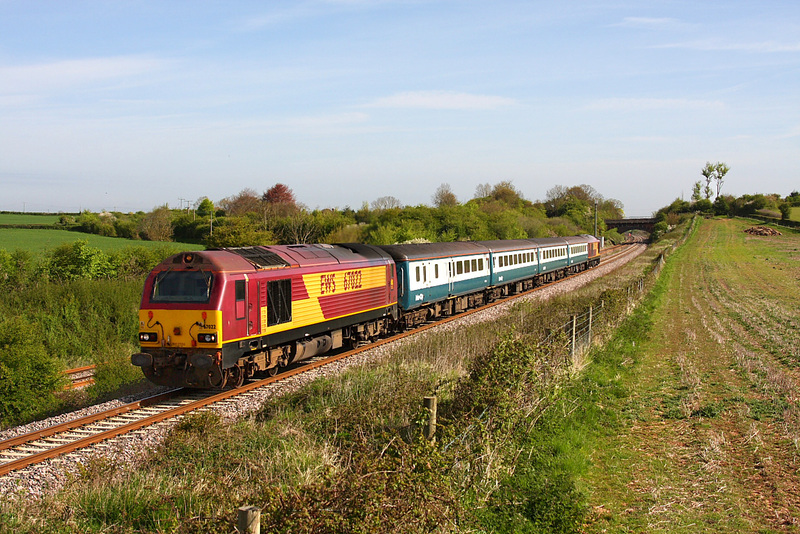 Here is the return leg of a Luncheon Special from Chichester to Westbury that was using the VSOE-set.Running as '1Z84' the 13:44 off Westbury is seen passing Norton-Bavant in the Wlyle-Valley with 'Royal' 67006 in charge.For operational reasons 67028 was DOR and not quite visible on this shot. 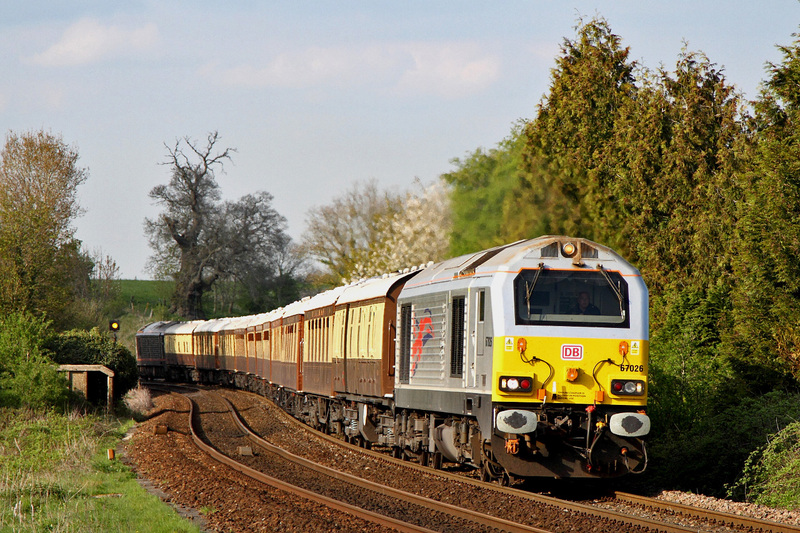 'A Shropshire Lad' 67012 heads '1R47' from Marylebone going to Birmingham Moor Street.DVT 82302 was thankfully on the back end and not leading.For some reason most of this evenings LCHS services were replaced by DMU's.Instead of the expected 5 workings only 2 appeared and one of those was not in its allocated slot. 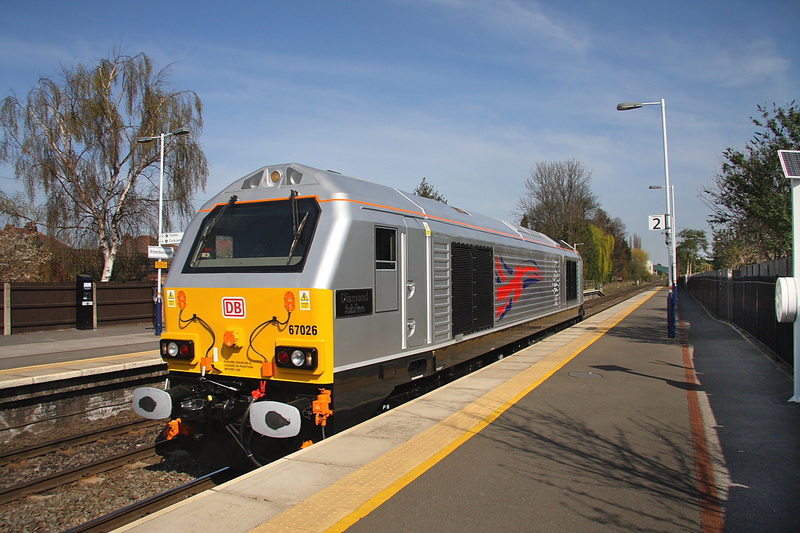 Location is of course Kings Sutton. No quite the picture I really wanted. For some reason my camera suffered a 'BrainFart' and malfunctioned causing a premature shutter release and loss of the main 'pull-back' shot.So beggers can't be choosers and after a lot of tweaking and cropping what you see is what you get! 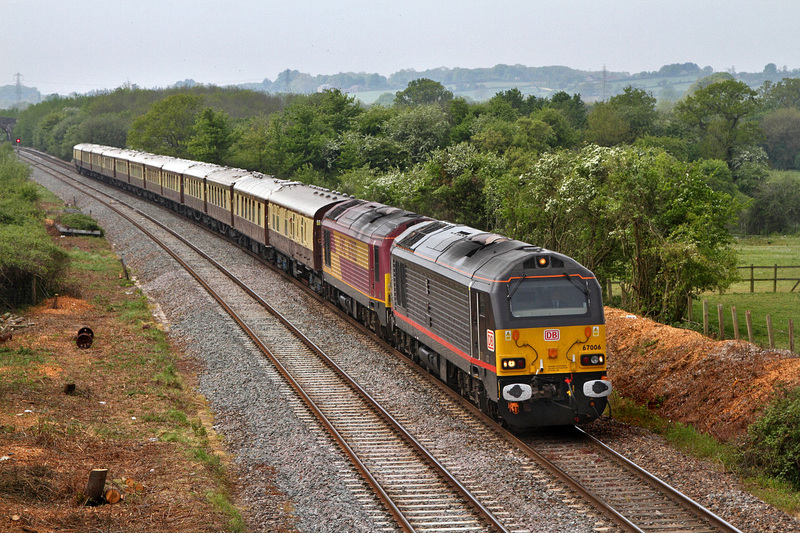 EWS 67017 'Arrow' heads '1G49' the 17:06 from Marylebone going to Birmingham-Show Hill. 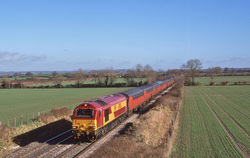 Location of coarse is the iconic Kings Sutton south of Banbury. 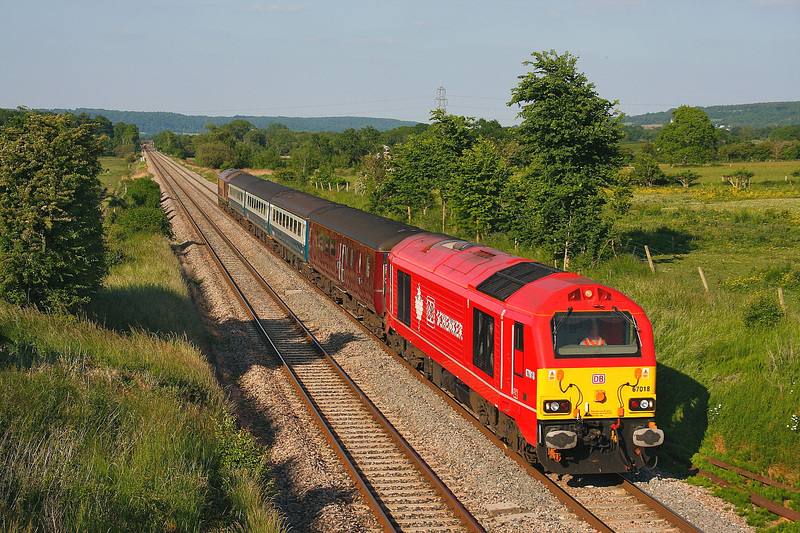 Faded EWS-Red 67028 climbs Upton-Scudamore Incline past Dilton-Marsh Halt with a 'VSOE' from Bath returning to London-Victoria running as '1O92'.This was unusually running on a Friday as its usual slot is on a Wednesday. 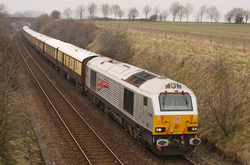 67026 now in EWS-Silver with a Union-Jack on its flanks today powered the VSOE from London-Victoria to Bath-Spa. 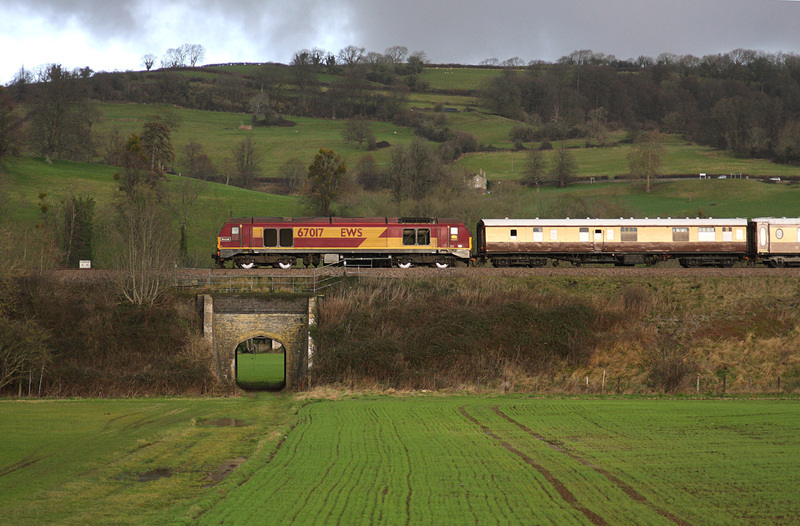 Here it is on the return leg '1O92' having departed Bath at 15:55.I was tempted out despite the low low temperatures (0-degees C) to come here to see it passing Upton-Scudamore about 2 miles south of Westbury.Note the flecks of snow to complete the wintery scene even though British-Summer Time commences in 3 days time! 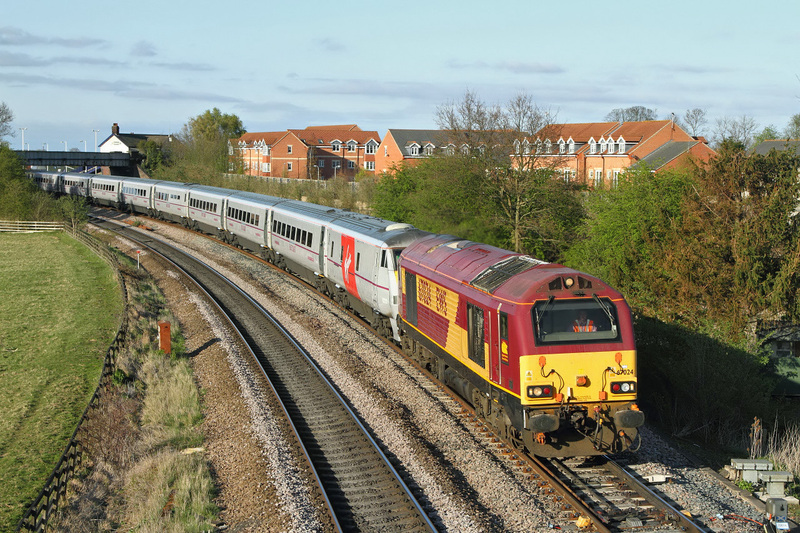 GM 67023 wearing its rather worn-out EWS-Red livery passes Shrivenham with the VSOE-Set being used for '1Z57' the 11:37 from Paddington going to Cardiff.The passengers were looking forward to an English Victory against Wales at the Millennium Stadium to clinch the 'Six Nations Rugby Title'. Unfortunately they were thrashed 30-3 by the Welsh who were crowned Champions instead.Never mind I expect plenty of booze was consumed on the way back to London drowning their sorrows! 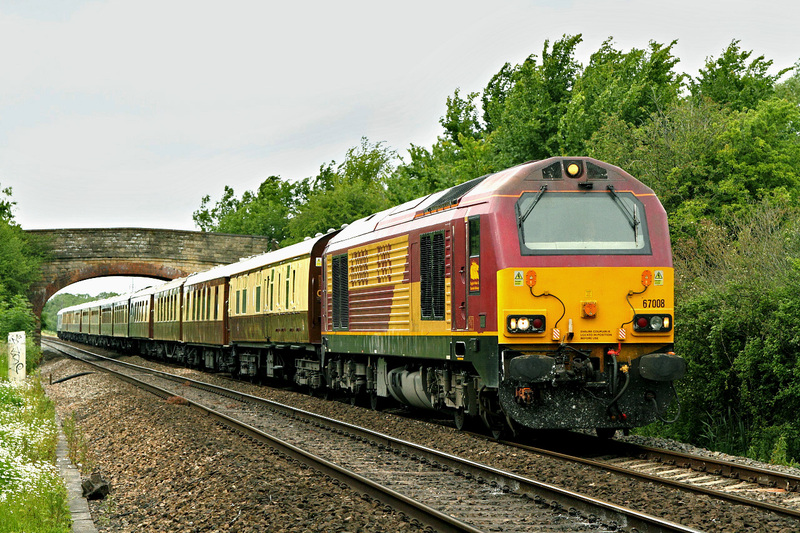 'Dyfrbont Pontcysyllte' pushing towards journeys-end, Birmingham-Moor Street with '1R25' that departed from London-Marylebone at 11:06, (DVT 82303 was leading).Location is again Bordesley in the centre of Birmingham. 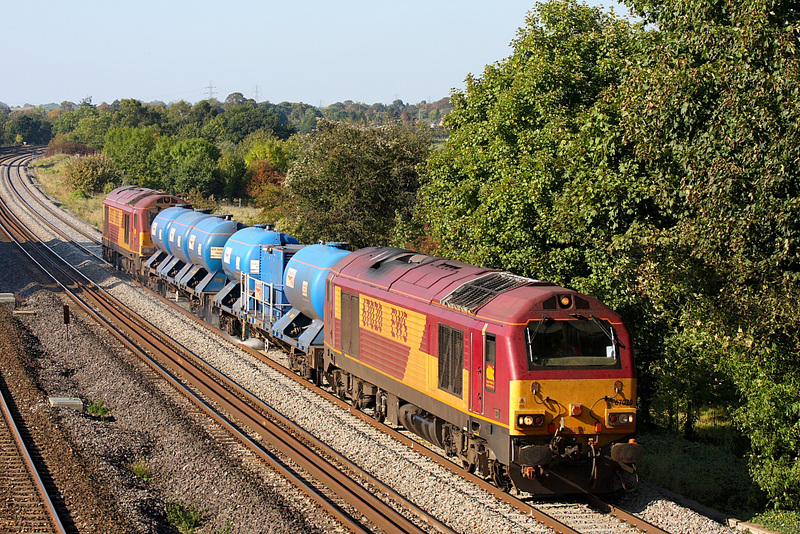 I really must make more of an effort with these LCHS workings as they are really very clean and tidy and run invariably to time. 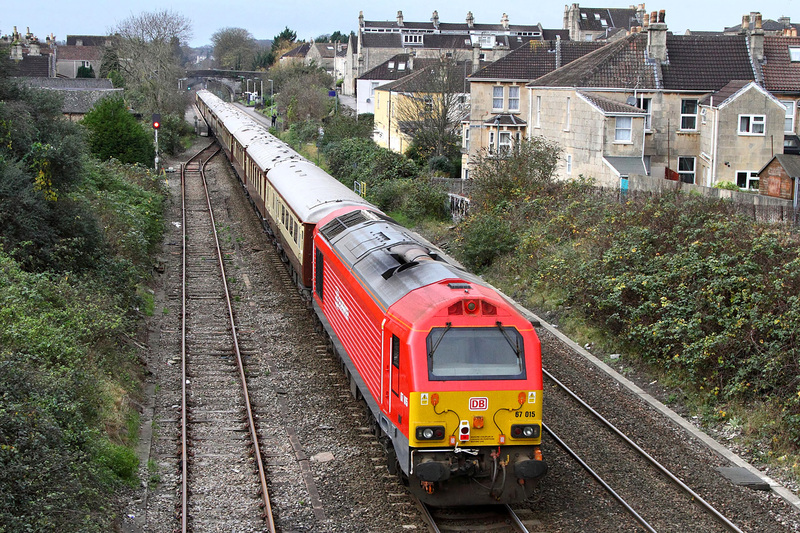 I got the message this working had just left Bristol-SFM so a quick trip from Frome enabled me to picture it arriving at its destination-Westbury a few minutes after I had also got there. 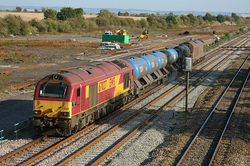 Here is '6Z71' with its set of RHTT wagons&tanks coming off the line from Bristol passing the powerbox at Westbury. 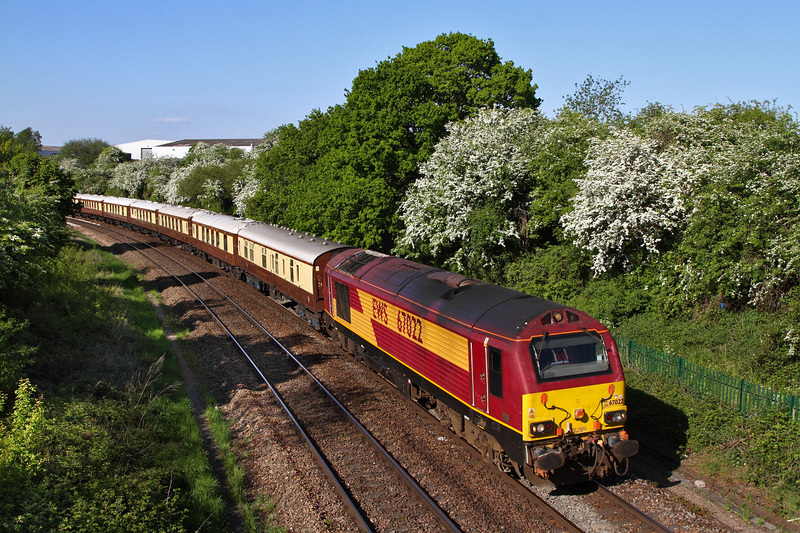 Royal 67005 'Queens Messenger' doing the duty. 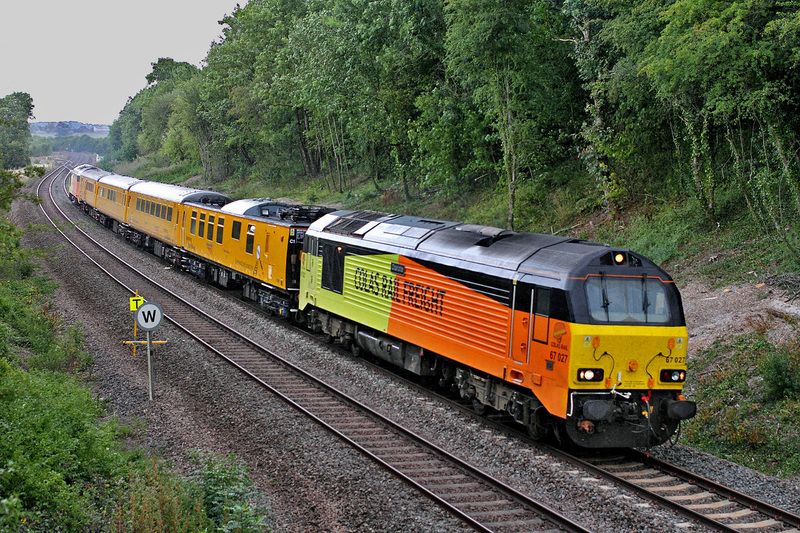 The two so called dedicated Royals 67005/67006 do not seem to be doing much work these days on duties for the Monarch probably because they are now getting quite tatty and are really in need of another full repaint to match the standard expected of them.Something DBS are probably too tight to want to do! I know it a 'GAW' shot but its far more pleasing than the previous one which was still rather backlit. 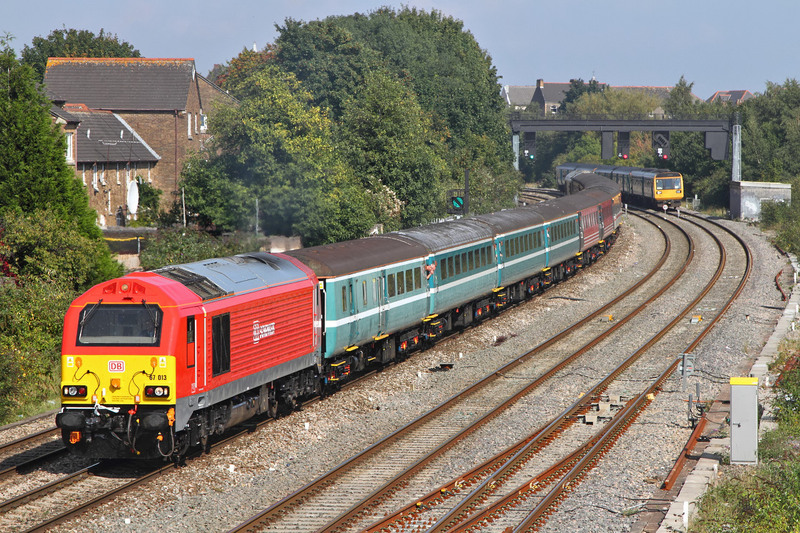 With 4-tracks here it does not look too out of place anyway.Here 67001 brings up the rear of '1V31' from Holyhead going to Cardiff.67002 being the lead-loco.Since the DVT's are still not ready for service two locomotives are now required due to a route change/reversal when the new timetable was introduced on the 15th of September.Location is east of Marshfield between Newport and Cardiff. 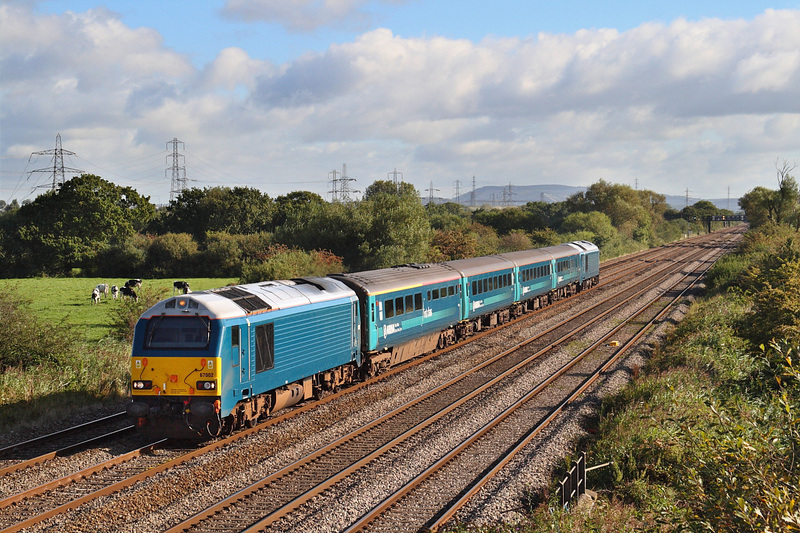 The 05:32 from Holyhead to Cardiff '1V31' speeds past Coedkernew.67002 leading and 67001 DOR.Since the introduction of the new timetable on the 15th of September (yesterday) this working is as a temporary measure a 'Top-n-Tail' set-up due to this service now going via Wrexham instead of Crewe.Thus requiring it to reverse at Chester.ATW were obviously expecting the DVT's to be operational by the new timtable start-date but they wern't!---Almost certainly a paperwork issue because thats the way it is these days! 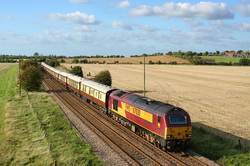 A Luncheon special using VSOE stock ran today from Chichester to Westbury and return.Here is the outward leg '1Z85' passing Bapton in the Wylye-Valley.The Jubilee adorned Skip 67026 was on the rear to facilitate a quick turnaround at Westbury.Anticipation as high for the return working just over an hour later with 67026 leading.Regretfully the haze got the better of the situation.If you really want to see that shot click HERE.Not that clever but there for reference..
67003 powers up through Ponthir shortly after departing Newport with the 16:15 from Cardiff going to Holyhead '1W91'. 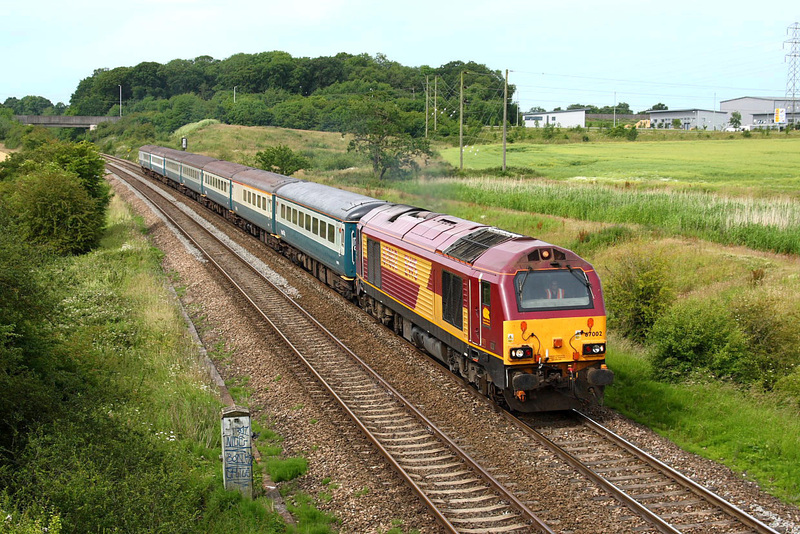 Note the Pensioner flailing out of the front coach window! I think at his age he should really know better.Silly old Sod! 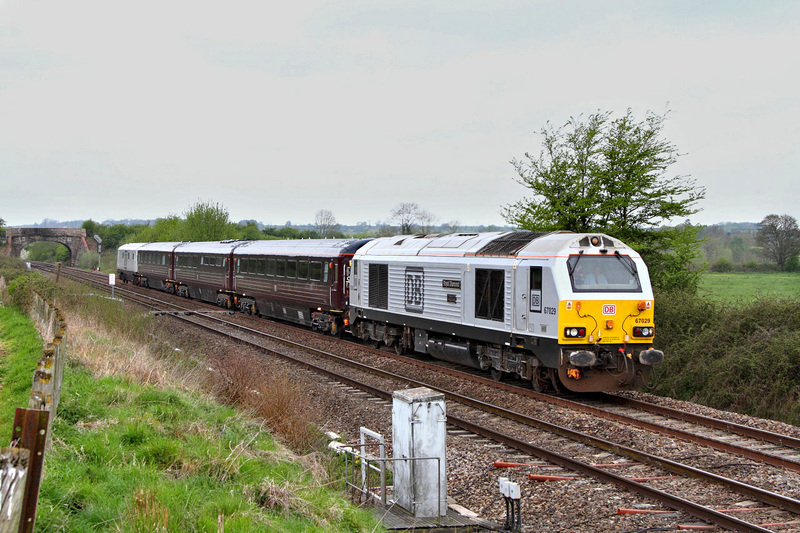 Schenker Silver liveried 67029 complete with a full-height DB logo on the side to replace the EWS 'rampant heads' powers up through Old-Dilton on the Upton-Scudamore Incline wth '1O92'.Although its departure from Bath to return to London-Victoria was on time a failure of a preceeding Portsmouth bound '158' delayed it by almost an hour!.Here is the VSOE set with a very smart 67029 looking superb in the low evening light.The 90 minute wait was well worth it in the end. 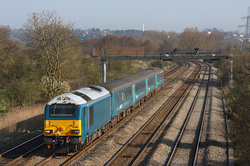 A mobile message gave information that this engine 67026 in its new coat of 'Jubilee' Silver was going to be on a Beeston to Toton 'X' working.A mad dash to Attenborough Station just south of Beeston enabled me to picture the light engine (without its load) returning to Toton.A right grab-shot this, having sprinted up the platform with it in sight about 150 yards away.Not to worry,at least it shows off the new livery nicely! Pity about the lack of white in the Union Jack,not to mention the childlike scribble further down its flank. I doubt the French or Italians would have allowed such an omission or addition!!!! 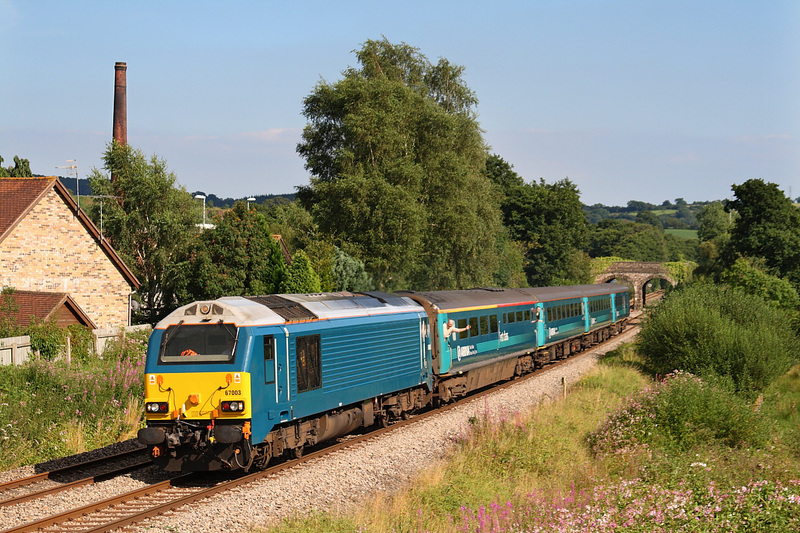 Arriva-Blue 67002 hums up through Ponthir with '1W91' from Cardiff-Central heading for Holyhead.This is the return leg of the first full day using Class-67 traction that has replaced 57's,these having handled the service for several years.Next change in this service involves using DVT's thus avoiding having to run the engine round at either end of the journey and the need for a duty shunterman at two locations. 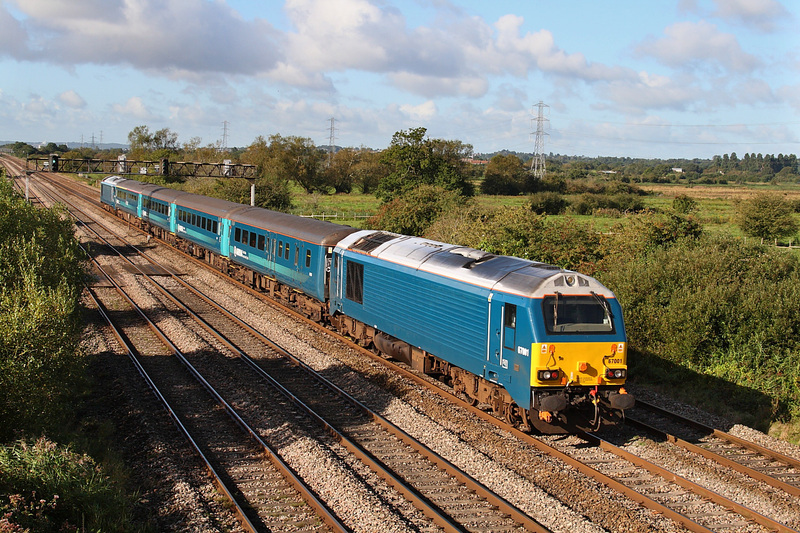 THe Class-67 Takeover of the Holyhead-Cardiff Service finally happened with this day being the first full out and back duty for that traction type.Here is seen 67002 in the dedicated 'Arriva-TW' colours with '1V31',the 05:32 off Holyhead to Cardiff-Central passing Duffryn still operating as 'Loco&Coaches'.Presumably the DVT will be added soon as was mooted. 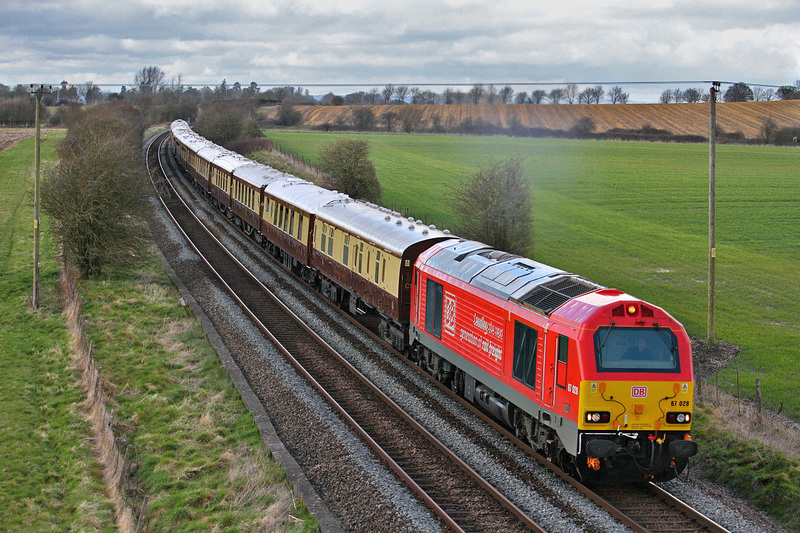 'Arrow' 67017 with 67016 DOR passes Badgeworth just west of Cheltenham with the ECS '5Z18' shortly after disgorging its load of race-goers off '1Z18' bound for the 'Gold Cup' Meeting there.This Special originated at London Euston.It went to Gloucester from where it returned 30 minutes later going to Worcester for servicing and stabling for the day. The 'VSOE' today served as transport for all the Well-Heeled Punters from London intent on blowing a fortune on some fruitless bet at the Cheltenham Gold-Cup Meeting today.The actual fare being a minor inconvenience for their deep pockets! 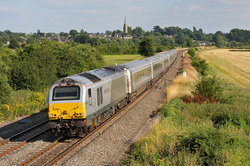 Traction for this train '1Z88' from Victoria to Cheltenham-Spa was 67029 seen here sporting its recently updated Silver-Livery showing ownership now in the hands of DB-Schenker.Probably the most tasteful colour scheme so far from the Krauts.Location is Badgeworth nr Cheltenham. Here is one of the latest products of the Paintshop at Toton.67002 now wearing the base-blue of ATW with no branding whatsoever.I have to say it looks rather bland.The plates have also been removed,albeit with good reason as the name 'Special Delivery' was very Post-Office/RES orientated.The loco now does a passable imitation of 50019 'Ramillies' which wore this style just prior the withdrawal last century. 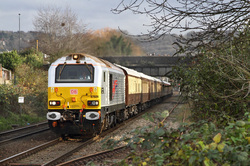 67017 catches a slight glint of weak sun as it crosses a small under-bridge at Newton-St-Loe nr Bath.This was the ECS off '1Z91' VSOE from London-Victoria to Bath heading for Bristol to be stabled there until the return duty later. 'Arrow' 67017 powers over Newton-Meadows shortly after departing Bath with the ECS '5Z91' to Bristol-East Yard where it will layover until the return later in the afternoon back to Bath then on to London-Victoria with its load of 'High-Tariff' passengers. 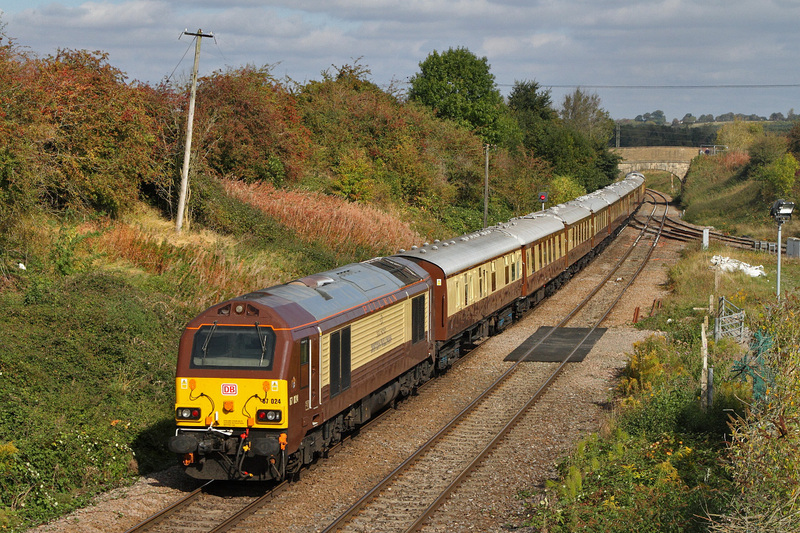 This unusual working was the reason I left the comfort of my armchair this afternoon.67025 'Western Star' was delivering a restored Mk-1 Brake-2nd Coach (BSK 35317) to Yeovil-Junction from Derby-RTC.Reporting number for this working was '5Z65'.Location is Fairwood nr Westbury. 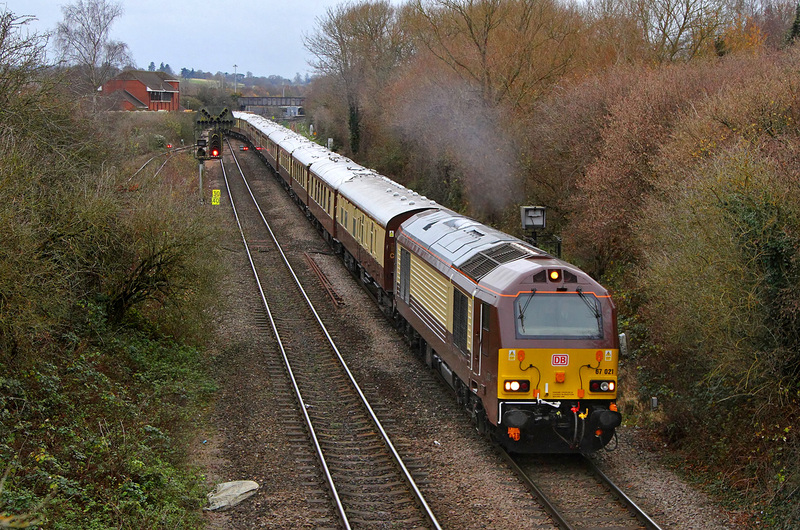 '3J41' the Didcot based RHTT passes South-Moreton shortly after departing from there running down to West-Ealing.Water-jets already blasting the railheads to clear any 'leaf' contamination.Grubby 67020 is leading and not quite so grubby 67027 bringing up the rear.Being a nocturnal breed these RHTT workings start work in late afternoon when shadows are getting quite long. 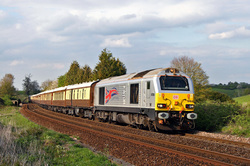 '1Z91',the VSOE Luncheon Tour that started at Winchester and has run via Salisbury/Westbury and Chippenham passes Didcot-East actually running a few minutes ahead of time.From here it continues back down south to Southampton.From there it continues on again and eventually arriving at London-Victoria at 21:00 tonight.Due to a couple of reversals being needed the train was T&T.Luckily for the leg past Didcot 67003 in its freshly applied 'Arriva' Livery was on the front.Dull old EWS 67030 being DOR at this time. 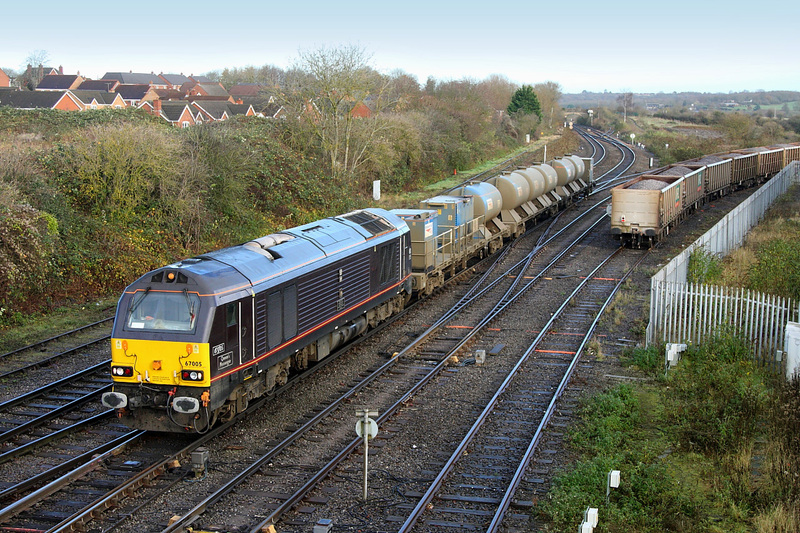 67020 and 67027 form the bookends for this RHTT '3J41' from Didcot to West-Ealing loop.Seen passing Lower-Basildon happily squirting its way along the up-relief. Footnote--I suppose the 'J' in the reporting number stands for jet as in waterjet as in watercannon as in RHTT. 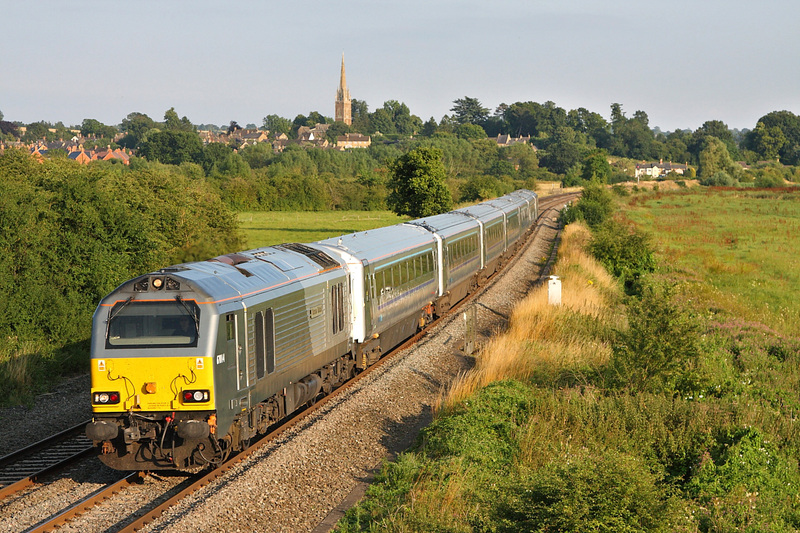 Running about 20 minutes behing the A4 on the 'Bath Spa Express' was another prestige working,the 'VSOE' from Bristol again,this time going to London-Victoria.DBS thoughtfully providing the grubby 'Skip' 67030 to work the train.Running as '1O92' it is seen cresting the Upton-Scudamore Incline at Arn-Hill just as the assembled travellers/diners within are tucking into their incredibly expensive afternoon tea! 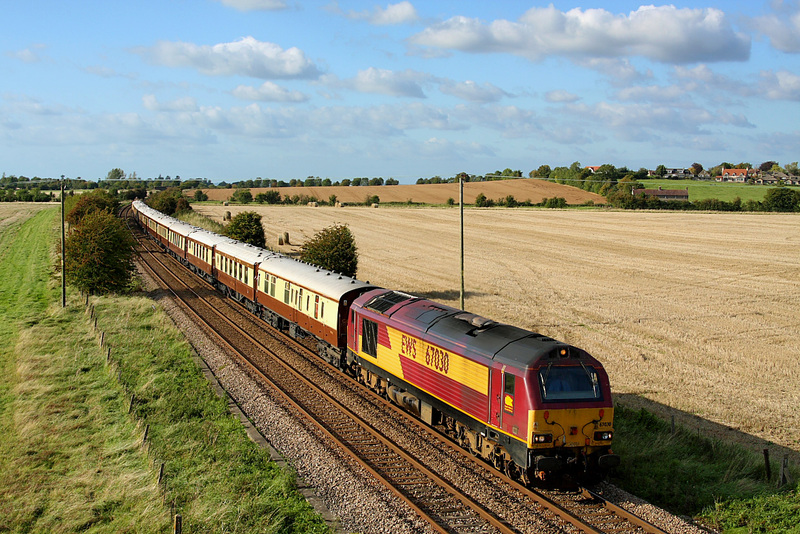 67028 heads '1Z85',a VSOE Luncheon trip from Chichester to Westbury and return.Here viewed passing Norton-Bavant about 7 miles short of its destination.67008 was doing T&T duty but is regretfully unseen in this particular shot.Scratchbury Hill forming the backdrop. 67002,aptly named 'Special Delivery'was the GM that famously ended up 'ON' an HAA coal hopper in an accident in Bristol a few years ago heads '1Z27' sponsored by 'RailEasy' from Frome going all the way to Preston with ex-attendee's of the annual mudfest at Glastonbury.Seen passing Berkley nr Frome shortly after commencing its journey.Happily the train seemed very well filled unlike the 'down' train last week when only about 100 people were carried. 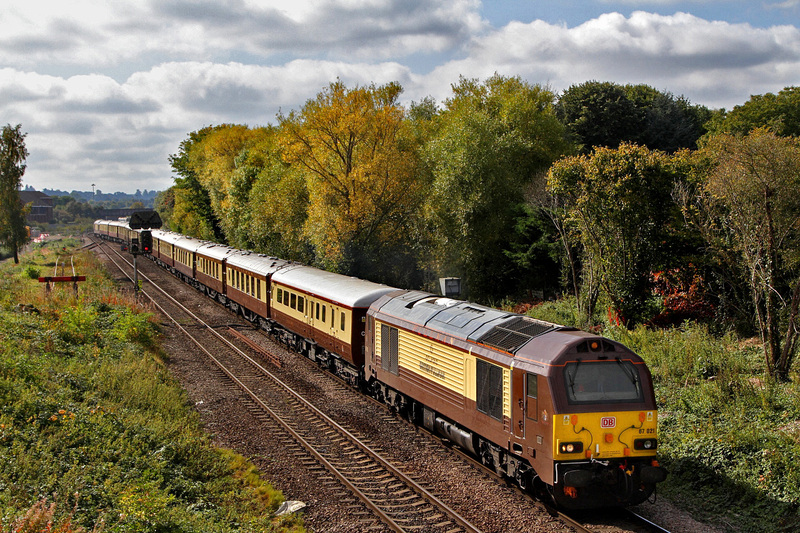 A royal couple out for a stroll on the WCML. 67006 'Royal Sovereign' apparantly dragging 71000 'Duke of Gloucester'' but actually being pushed! passes Chelmscote going to Castleton,(access to the ELRly) from Hither-Green. ..07 march 2011.. 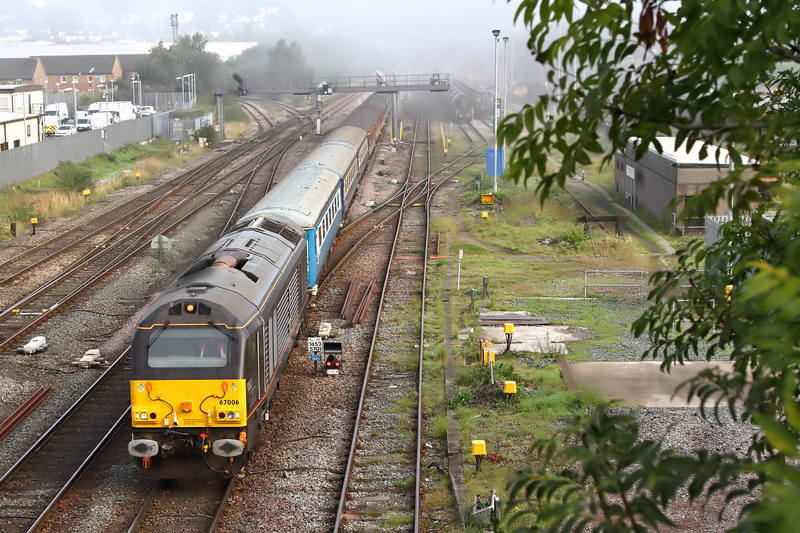 Early morning Excursion by Pathfinder-Tours from Exeter (06:47 off) going over the Carmarthen (As far as Bristol-TM where GWR-Steam King 6024 took over) passes Clink nr Frome.Working as '1Z70' and graced by Royal motive power! 67005 'Queen's Messenger. 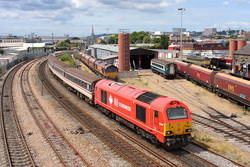 ..30 august 2010..
'Keith Heller' 67018 was today used on the 11:00 Taunton to Cardiff service.Here the distinctive 'MapleLeaf'' Skip is viewed passing Bristol's Barton-Hill Depot who's main funtion these days is coal-wagon repairs.In fact in the siding is a GM-66 with a short set of repaired hoppers about to depart of the Avonmouth -BHT. 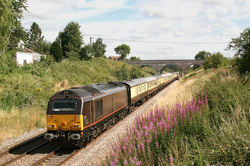 ..06 july 2010.. 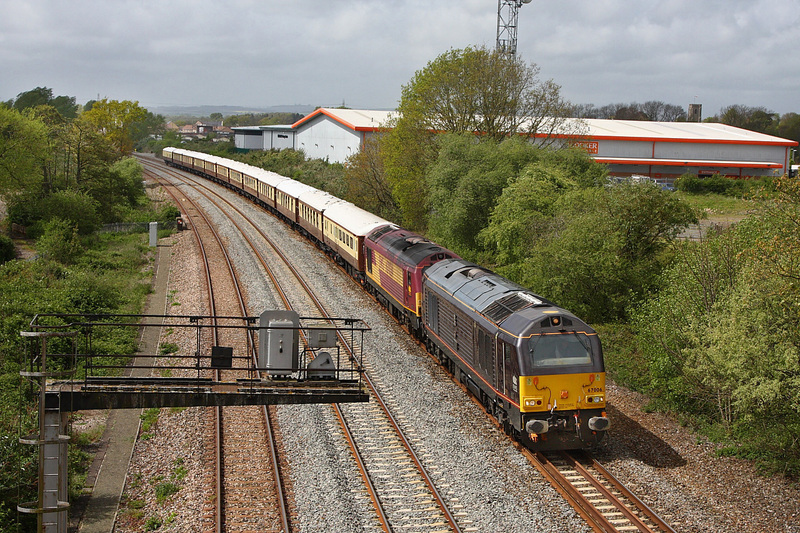 The 16:16 off Taunton going to Cardiff '2U24' passes Pilning on the approach to the Severn-Tunnel.67029 leading with the 'Maple-Leaf' 67018 DOR.Complete set of I/C coaches today. 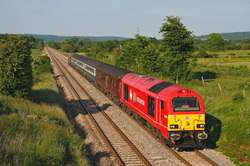 ..05 july 2010..
67017 'Arrow' passes Thornford on the single line between Dorchester and Yeovil.Working the 16:55 from Weymouth back to Bristol '2V67'. The '2C85' from Cardiff to Taunton speeds down past Yatton-Kenn Moor Gate in the lengthening shadows of the early evening.Sticking out like a sore thumb was the lead loco 67018 named 'Keith Heller',a Canadian who has recently departed the DBS Company.Hence the rather large Maple Leaf adorning the flanks.67003 was the much more sober looking liveried GM on the rear. 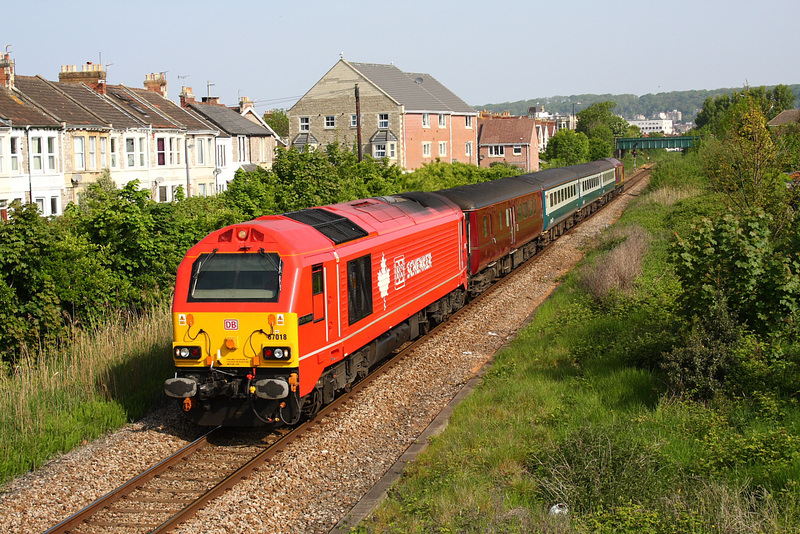 67018 'The Maple-Leaf' exits Weston-s Mare with '2C67' from Cardiff going to Paignton.Captured passing Sunnyside Road in the Town there. 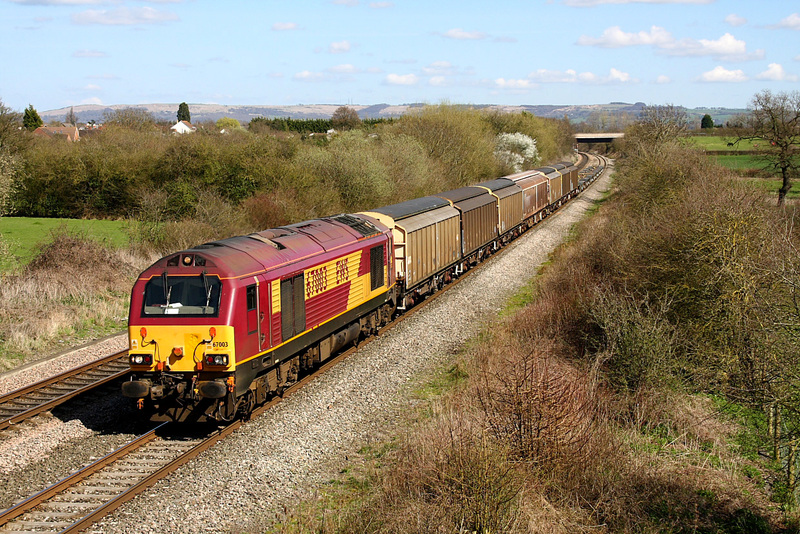 67022 and 67017 teamed up to work '2C67' from Cardiff down to Paignton.Seen here on the short single-line section on the approach to Cogload-Flyover,a somewhat redundant piece of infrastructure since the loss of four tracks from here into Taunton. 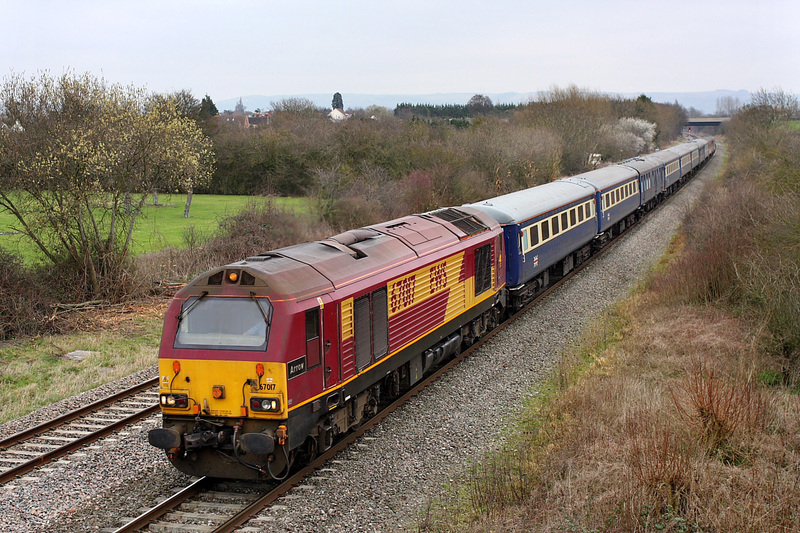 Just occasionally this Government sponsored working for the MOD from Ashchurch back to Didcot ''6A36' is rostered to a '67'. 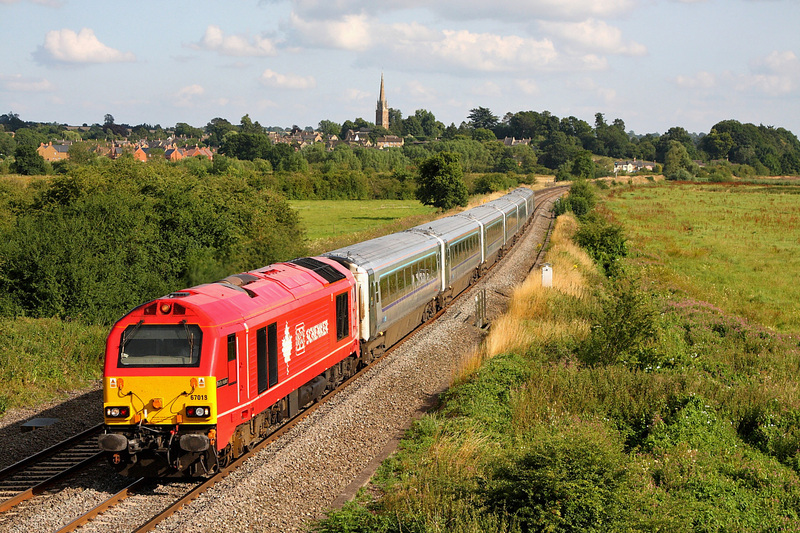 Here is 67003 hauling a few Ferryvans and some Warflats.Viewed passing Badgeworth nr Cheltenham. 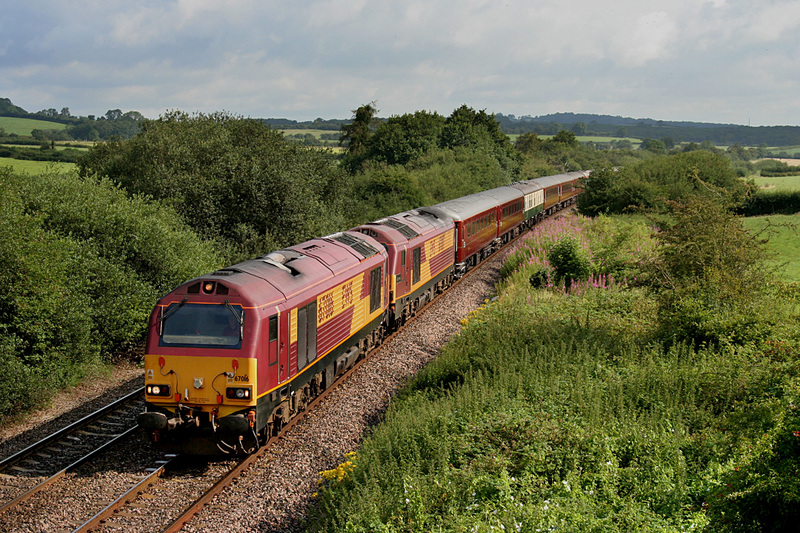 Summer Saturdays used to produce LCHS until 2010 (the final year) on the crowded route to Weymouth from Bristol.Here is 67005 with 67026 DOR on the returning '2V67' shown approaching Thornford in Dorset.Pity the poor punters in 2011.All they have to look forward to now is a pair of 153's and a long noisy journey standing-up.That is if they manage to squeeze on at Weymouth? 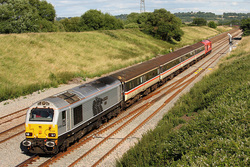 Good old FGW,putting the customer last,maximising profit and to hell with them! 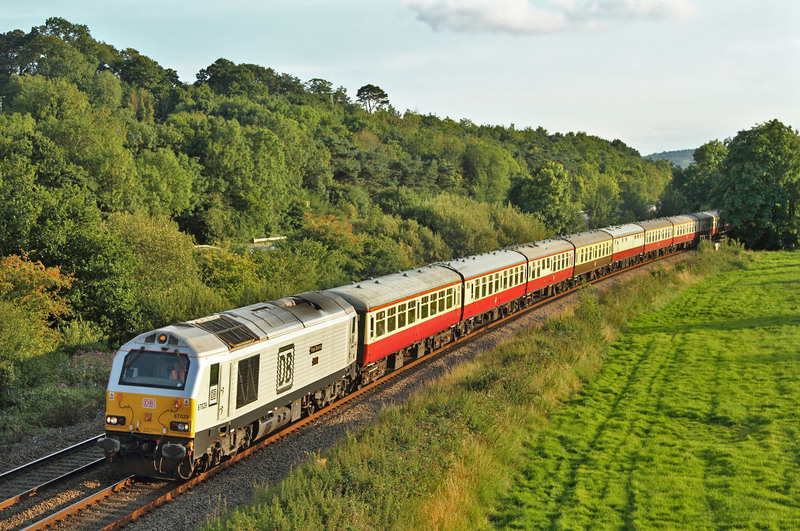 The original '67' to enter the country was this one-67003.At this time still wearing its original EWS-RED.Nowadays of coarse it is in Arriva blue livery Here it is on a Pathfinder Tour 'The Tamar Tornado'.This departed from Birmingham International at 06:36 as '1Z60' and was replaced at Bristol-TM by Steam- 60163 'Tornado' for the run to Plymouth,the tours destination. 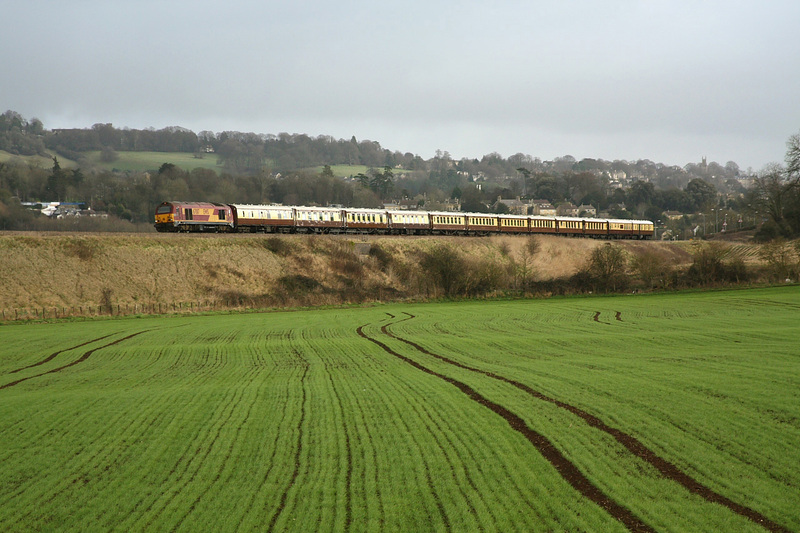 It is pictured here passing Charfield to the north of Bristol.Forget any thoughts of photography here in 2014 (5 years later),the bush growth would be over your head now! 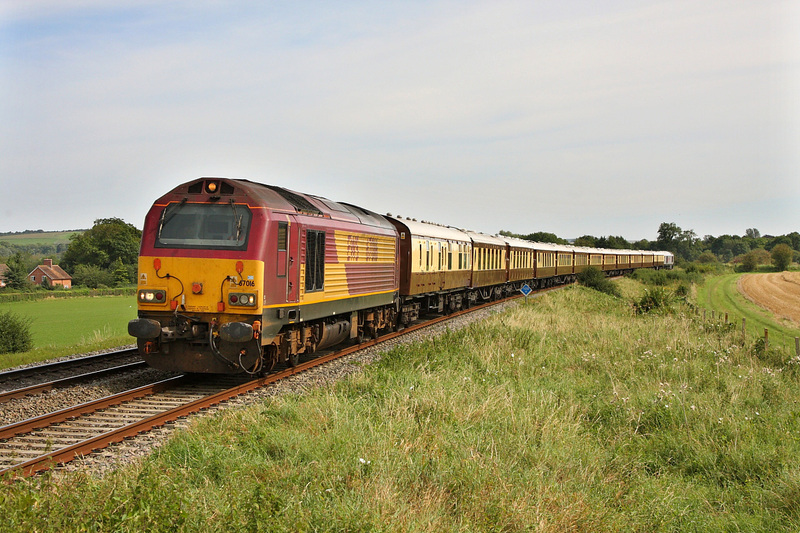 '1Z76' from Torquay going to Great Chesterford (Wherever that is?) 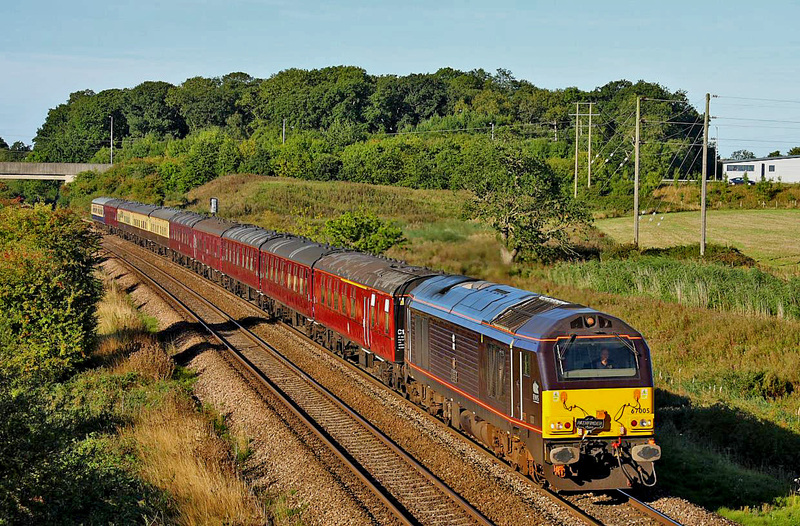 hauled by Royal-Skip 67005.Here sweeping throuth Great-Cheverell on the B&H heading towards London. Last built 'Skip' 67030 motors under the road bridge at Bunn's Lane nr Witham Friary with a weekend junket operated by the then VSOE-Company from London-Victoria going (I believe) to Truro. 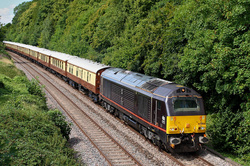 This working from Ealing-Broadway in London was hauled by 67006 'Royal Sovereign' as far as Taunton.From there Steam Loco 34067 took this train '1Z27' onward to its destination at Kingswear in Devon.Location is local favourite for me ,Styles-Hill Footbridge on the Frome Avoiding-Line. 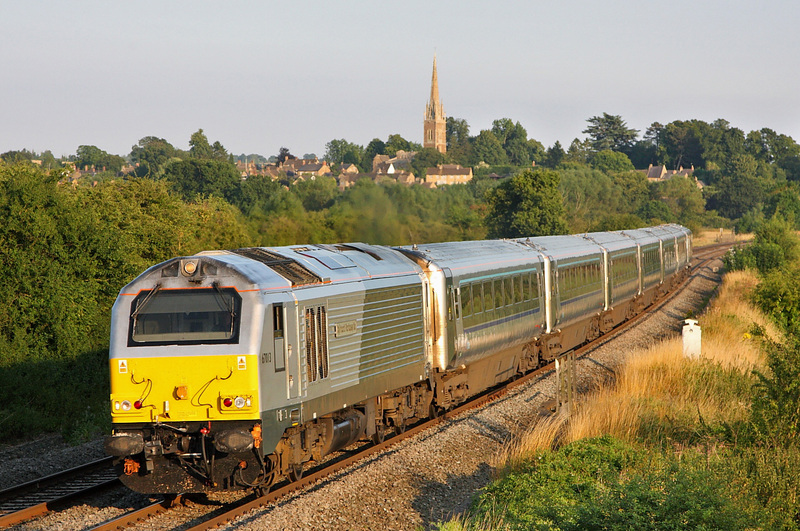 Travelling from London-Victoria to Truro via Melksham was '1Z67'.Another trip out for the 'Better Off' in our Country on the VSOE. Here is 67024 speeding down the Frome Avoiding Line heading for Cornwall. 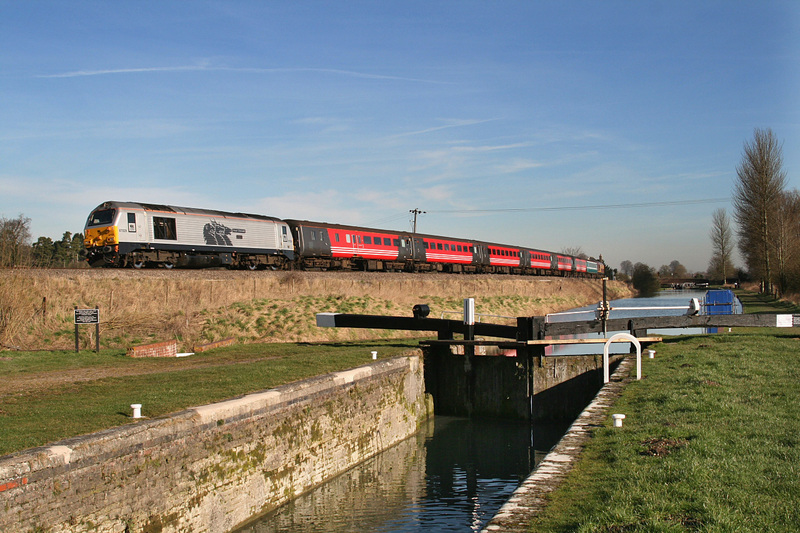 A Rugby-Extra from Paddington to Cardiff '1Z31' was today routed via the B&H.67029 recently named 'Royal Diamond' was leading the mainly ex-Virgin stock with 67024 DOR.The working is seen passing the Kennet & Avon Canal at Crofton on a superb cold-cold winters morning! Royal 67006 makes a fine sight as it climbs Upton-Scudamore Incline past Old-Dilton with a returning VSOE from Bath back to London-Victoria. Class 67's 67016/67017 head '1Z88' from Brighton&Hove going to Penzance with most passengers heading for the 'Eden-Project'.The working seen at Strap Lane near Upton-Noble. The regular excursion 'VSOE' from London-Victoria to Bath and back via Salisbury is seen approaching Westbury with the return leg. 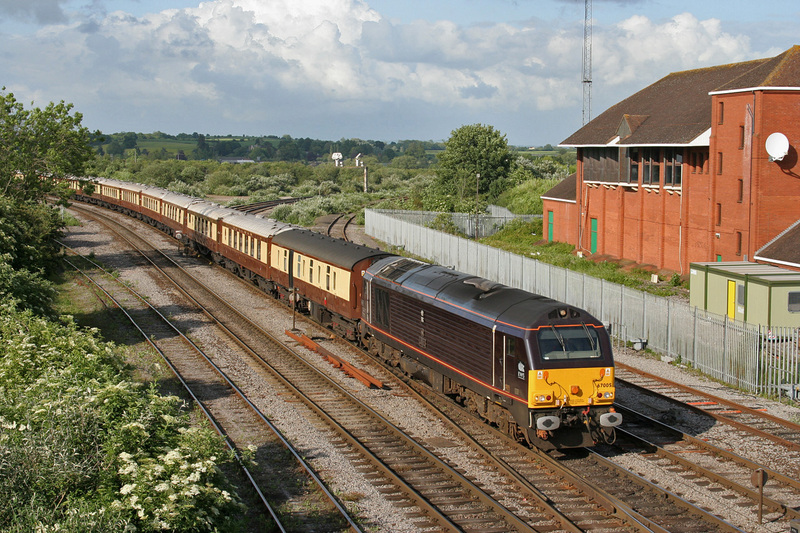 'Royal' 67005 named 'Queens Messenger' heads the classic set of Pullman stock. This is an early digital picture using a Minota Dimage-7I.Only 5m pixels and plenty of grain as well!. 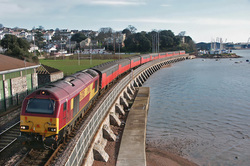 67015 rounds the curve shortly after passing through Teignmouth with the morning 'vans' from Bristol-Temple Meads to Penzance. 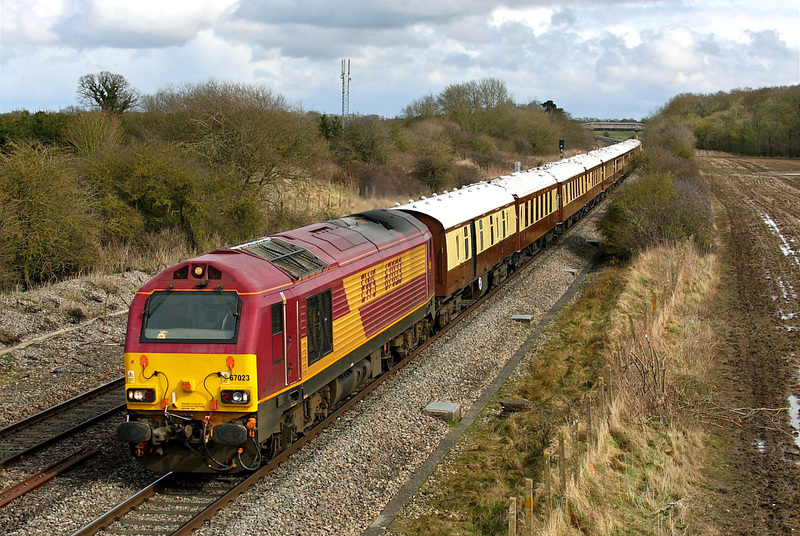 This train only had a few weeks to go before the service was dispensed with altogether after the Royal Mail pulled out of the 'Mail by Rail' contracts. 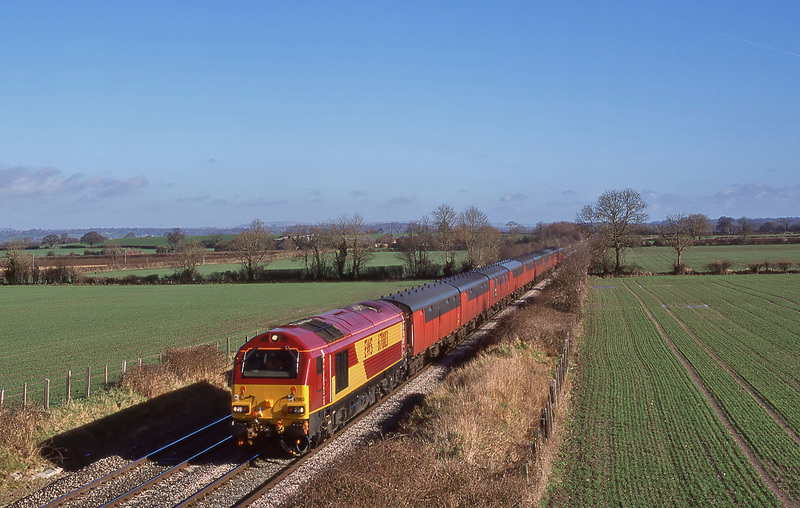 When this picture was taken 67003 was the sole member of this 30 strong class to have made it into service in the UK.It is viewed passing Baynton Farm nr Bratton east of Westbury with a test-train of RES-Vans going from Old-Oak-Common down as far a Taunton and return ('5Z67' ? 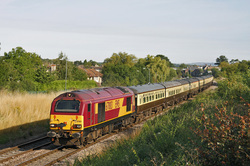 ).Their purpose for use in this country was RES-postal trains but by the end of 2003,just 3 years later all that came to a sad end due to arguments between EWS and the Post-Office.However in 2013 this class is now much in demand on various passenger services around the country having proved themselves as a very capable and reliable locomotive.